2010-10-12 First worldwide family litigation filed litigation Critical https://patents.darts-ip.com/?family=38462321&utm_source=google_patent&utm_medium=platform_link&utm_campaign=public_patent_search&patent=CN101443405(B) "Global patent litigation dataset” by Darts-ip is licensed under a Creative Commons Attribution 4.0 International License. The invention provides compositions for blow molding applications and other applications, where such compositions comprise a high molecular weight ethylene interpolymer and a low molecular weight ethylene polymer, and where the high molecular weight ethylene interpolymer has a density from 0.920 g/cm<3 >to 0.950 g/cm<3>, and an I2I from 0.05 to 1 dg/min, and where the low molecular weight ethylene polymer has density from 0.965 g/cm<3> to 0.985 g/cm<3>, and an I2 from 600 to 2000 dg/min. The composition has a density from 0.950 g/cm<3> to 0.970 g/cm<3>, and comprises greater from 45 to 80 weight percent of the high molecular component, and from 20 to 55 weight percent of the low molecular weight component, based on the sum weight of the high molecular weight component and the low molecular weight component. The invention also provides for methods of preparing said compositions and for articles prepared from the same. 本申请要求2006年4月7日提交的美国临时申请No. 60/790，255的权益，其完全经此引用并入本文。  This application claims the United States April 7, 2006 Provisional Application No. equity 60 / 790,255, which is fully incorporated herein by reference. 本发明涉及用于制造高密度こ烯聚合物产品（如吹塑单层和多层瓶子和容器、装配的和模制的配件和附件和其它高密度聚こ烯产品）的こ烯聚合物组合物。  The present invention relates to the manufacture of high-density ko ko-en-ene polymer product (e.g., blow molding monolayer and multilayer bottles and containers, assembled and molded fittings and accessories, and other high-density polyethylene ko-ene product) polymer composition. 该组合物提供了提高的加工性能，如降低的瓶重，和提高的物理性能，如改进的树脂硬度，并且极小或没有损失抗应カ开裂性和抗冲击性。 The compositions provide enhanced processing properties, such as reduced bottle weight, and improved physical properties, such as improved hardness of the resin, and should be little or no loss of anti-crack resistance and impact resistance grades. 、 吹塑产品，如家用和エ业容器（例如盛放奶、果汁和水的塑料食品瓶；盛放洗涤剂和机油的化学瓶；和耐用储存筒）具有高的性能和外观标准。 ,  molding products, such as household and industry Ester container (e.g. accommodating milk, juice and water, plastic food bottles; chemical bottles accommodating detergent and oil; and durable storage cylinder) with high performance and appearance standards . 吹塑产品通常使用现有商业设备和现有吹塑加工技术在没有或极少作出设备变动的情况下形成。 Blow molding products are typically formed in the absence of or minimal equipment changes made using existing commercial equipment and existing blow molding processing technology. 此外，制造者试图使用于制造产品的周期时间最小化，因此增加的周期时间是不合意的。 In addition, manufacturers are trying to use in the manufacture of the product cycle time is minimized, thus increasing the cycle time is not desirable. 吹塑树脂的客户需求包括产品一致性、良好的可加工性、适当的树脂溶胀，和最大负荷（硬度、模量）、抗环境应力开裂性（ESCR)和抗冲击性的最佳平衡。 Blow molding resins include product consistency, customer requirements, good processability, adequate resin swell, and the maximum load (stiffness, modulus), environmental stress cracking resistance (the ESCR) and the best balance of impact resistance. 改进的树脂硬度会提高吹塑容器的负荷能力。  Improved resin stiffness will increase the load capacity of blow-molded containers. 由此，具有提高的硬度的轻型吹塑容器可用于替代更重的金属容器。 Thereby, lightweight blow molded containers having improved hardness may be used to replace heavier metal containers. 此外，这类更轻的容器可以更有效地堆放，从而更有效利用储存空间和运输空间。 In addition, such lighter weight containers can be stacked more efficiently, and thus more efficient use of storage space and transport space. 抗环境应カ开裂性（ESCR)是树脂对开裂引起的机械破坏的敏感性的衡量标准。  should be resistant to environmental cracking ka (the ESCR) is a resin to mechanical damage caused by crack sensitivity measure. 高密度こ烯聚合物、吹塑制品，如家用品和エ业品的吹塑容器的差的抗环境应カ开裂性阻碍了这些容器用于这类商品的用途。 Ko high density olefin polymers, blow molded articles, such as blow molded containers resistant to environmental difference household goods and industrial products should Ester ka cracking hinders the use of these containers for such goods. 由于ESCR不足，由高密度こ烯聚合物制成的吹塑容器可能在储存之前或之中开裂。 Due to insufficient ESCR, blow molded containers made of high density olefin polymers ko may crack before or during storage. 抗冲击性是容器韧性的衡量标准。  Impact resistance is a measure of the toughness of the container. 冲击强度差的容器在受到大力冲击时或在从高处落下时会开裂或断裂。 Poor impact strength of the container when subjected to strong impact or will crack or break when dropped from a height. 不足的抗冲击性导致吹塑容器对传统用途而言太脆。 Insufficient impact resistance leads to blow-molded containers for traditional uses too brittle. 美国专利6，194，520公开了能够吹塑并具有优异的可加工性的高分子量高密度こ烯聚合物共混物。  U.S. Patent No. 6,194,520 discloses a blow capable of having excellent workability and high molecular weight high density olefin polymer blend ko. 该共混物具有至少大约0. 930克/立方厘米的密度，至少大约2克/10分钟的流动指数（121)，至少大约60的流动速率熔体流动速率（MFR)和至少大约8的多分散性指数。 The blend has a density of at least about cc 0.930 g / multi least about 2 g / 10 min flow index (121), at least a flow rate of approximately 60 melt flow rate (MFR) of at least about 8, and dispersion index. 该共混物含有至少大约0. 3重量份数的密度为至少大约0. 900克/立方厘米、流动指数或高负荷熔体指数（121)为至少大约0. 2克/10分钟且流动速率（FR)为至少大约10的相对高分子量（HMW)组分；和密度为至少大约0. 930克/立方厘米且熔体指数（12)不大于大约1000克/10分钟的相对低分子量（LMW)组分。 The blend contains at least about 0.3 parts by weight of a density of at least about 0.900 g / cc, a flow index or high load melt index (121) is at least about 0.2 g / 10 min and a flow rate (FR) for the relatively high molecular weight (HMW) component of at least about 10; and a density of at least about 0.930 g / cc and a melt index (12) no greater than about 1000 g / 10 min relatively low molecular weight (LMW ) components. 美国专利6，316，546 (也參见美国专利6，458，911)公开了能够形成高強度薄膜的相对高分子量的高密度こ烯聚合物（HMW-HDPE)。  U.S. Patent No. 6,316,546 (see also U.S. Patent No. 6,458,911) discloses a high density ko diene polymer (HMW-HDPE) capable of forming a relatively high molecular weight of the high strength of the film. 这类聚合物具有至少大约0. 925克/立方厘米的密度，不高于大约15克/10分钟的流动指数（121)，至少大约65的熔体流动速率(MFR)，和不高于大约0. 7的在0. I弧度/秒下的动态弹性，不高于大约14E5 (14X IO5泊）的在0. I弧度/秒下的相应复数粘度。 Such polymers having a density of at least about cc 0.925 g /, not more than about 15 g / 10 min flow index (121), a melt flow rate of at least about 65 (MFR of), and not more than about dynamic elasticity at 0.7 0. I rad / sec no higher than about 14E5 (14X IO5 poise) at a corresponding complex viscosity 0. I rad / sec. こ烯聚合物是相对高分子量（HMW)和低分子量（LMW)こ烯聚合物的双峰共混物。 Ko bimodal olefin polymers are blends of relatively high molecular weight (HMW) and low molecular weight (LMW) polymer of ethylenically ko. 欧洲专利 1169388B1 (也參见W000/60001 和US 6，433，095)公开了具有18 或更大的剪切速率（SR)并包含至少20重量％高分子量部分的高密度多峰聚こ烯，其具有0. 930克/立方厘米或更小的密度（P )和0. 30克/10分钟或更小的高负荷熔体指数（HLMI)。  European Patent 1169388B1 (see also W000 / 60001 and US 6,433,095) discloses a shear rate of 18 or more (SR) and comprising at least 20 wt% of high density high molecular weight fraction of multimodal polyethylene ko alkenyl having 0.930 g / cc or less density (P) and 0.30 g / 10 min or less, a high load melt index (HLMI). 国际公开No. W02004/048468公开了包含20至50重量％こ烯与C3-C20 a -烯烃共聚单体的共聚物和50至80重量％较低重均分子量こ烯聚合物的聚こ烯组合物，其中该组合物的聚こ烯一起具有935至965千克/立方米的密度，60，000至300，000克/摩尔的重均分子量，0. I至10克/10分钟的在190°C下的MFR2.16，和2. 5至20的分子量分布（MWD)。  International Publication No. W02004 / 048468 discloses a composition comprising 20 to 50 wt% ko alkylene C3-C20 a - poly-olefin comonomer and 50 to 80% by weight low-average molecular weight of the olefin polymer ko ko ene composition, wherein the composition has a poly ko alkenyl with from 935 to 965 kg / cubic meter density of 60,000 to 300,000 grams per mole weight / average molecular weight, 0. I to 10 g / 10 min MFR2.16 at 190 ° C of, and molecular weight distribution (MWD) 2. 5 to 20. 该共聚物具有0. 006至9摩尔％的共聚单体含量，和每1000个碳0. 03至45个分支的支化度。 The copolymer has from 0.006 to 9 mole percent comonomer content per 1000 carbons and from 0.03 to 45 branches of the degree of branching. 该こ烯聚合物具有939至975千克/立方米的密度和20，000至200，000克/摩尔的、重均分子量。 The olefin polymers having ko 939-975 kg / cubic meter and a density of from 20,000 to 200,000 g / mole weight average molecular weight. 欧洲申请No. 1201713A1公开了包含35至49重量％的高分子量第一聚こ烯部分和51至65重量％的低分子量第二聚こ烯部分的共混物的聚こ烯树脂。  European Patent No. 1201713A1 discloses a polyethylene resin comprising an ethylenically ko 35-49 wt% of a first high molecular weight polyethylene blend ko alkenyl moiety and from 51 to 65 wt% low molecular weight polyethylene ko alkenyl second portion. 该第一聚こ烯部分包含密度为最多0. 928克/立方厘米且HLMI小于0. 6克/10分钟的线型低密度聚こ烯，第ニ聚こ烯部分包含密度至少0. 969克/立方厘米且MI2大于100克/10分钟的高密度聚こ烯。 The first portion comprises a density polyethylene ko ethylenically most 0.928 g / cc and a HLMI of less than 0.6 g / 10 min linear low density polyethylene ko alkenyl, alkenyl ko second portion comprises poly Ni density of at least 0.969 g / cc and a MI2 of greater than 100 grams of high density / 10 min alkylene poly ko. 该聚こ烯树脂具有大于0. 951克/立方厘米的密度和I至100克/10分钟的HLMI。 The ko poly terpene resins having greater than 0.951 g / cm3, and I to 100 g / 10 min HLMI. 美国公开No. 2004/0266966公开了具有多峰分子量分布且密度为0. 925克/立方厘米至0. 950克/立方厘米，熔体指数（12)为0. 05克/10分钟至5克/10分钟的聚こ烯树脂。  U.S. Publication No. 2004/0266966 discloses a multimodal molecular weight distribution and a density of 0.925 g / cc to 0.950 g / cc, a melt index (12) of 0.05 g / 10 min to 5 g / 10 min ko poly terpene resins. 该聚烯烃树脂包含至少ー种高分子量（HMW)こ烯共聚体和至少ー种低分子量（LMW)こ烯聚合物。 The polyolefin resin comprises at least species ー molecular weight (HMW) copolymer and at least ko alkenyl ー low molecular weight (LMW) ko olefin polymer. 美国公开No. 2004/0034169公开了包含低分子量（LMW)こ烯聚合物组分和高分子量（HMW)こ烯聚合物组分的聚合物组合物。  U.S. Publication No. 2004/0034169 discloses an olefin polymer and a high molecular weight component (LMW) ko composition comprising a low molecular weight polymer (HMW) polymer component ko alkenyl. 优选地，LMW聚こ烯组分和HMW聚こ烯组分在该组合物中共结晶以致其在薄层厚度分布（“LTD”）曲线中表现出单峰或基本单峰。 Preferably, LMW polyethylene component and a HMW polyethylene alkenyl ko ko alkene component in the composition such that it co-crystallized distribution ( "LTD") curve exhibits a single peak, or substantially single peak in a lamella thickness. 对于LMW和HMW聚こ烯组分，こ烯聚合物可以是均聚こ烯或こ烯共聚物。 For LMW and HMW polyethylene component ko alkenyl, ko olefin polymer may be a homo- or ko ko-ene copolymers. 优选地，这两种组分都是具有相同或不同组成（即具有相同或不同共聚单体）的こ烯共聚物。 Preferably, both components are the same or different composition (i.e., having the same or different comonomers) copolymer of ko. 美国专利7，166,676(也參见美国公开No. 2003/0055176)公开了通过在包含载体、过渡金属化合物和能够转化过渡金属化合物的活化剂的固态催化剂体系存在下使こ烯与至少ー种共聚单体共聚来制备包括こ烯共聚物的共混物的方法，该共聚単体选自式H2C=CHR所示的化合物（其中R是烷基或芳基)或ニ烯。  U.S. Patent No. 7,166,676 (see also U.S. Publication No. 2003/0055176) discloses in the presence of a solid catalyst system comprising a support, a transition metal compound capable of converting the transition metal compound and the activator with at least an alkenyl koー copolymerizable comonomers include ko prepared copolymer blend approach, radiolabeling the copolymer is selected from a compound of formula H2C = CHR represented by (wherein R is alkyl or aryl) alkenyl, or Ni. 欧洲专利No. 1093658B1公开了通信电缆用的绝缘组合物，其是通过至少ー种a -烯烃在多于ー个阶段中的聚合获得的多峰烯烃聚合物混合物，并具有大约0. 920-0. 965克/立方厘米的密度，大约0. 2-5克/10分钟的熔体流速（MFR2)，FRR21/2彡60，且根据ASTMD1693 (A/10% Igepal)的抗环境应カ开裂性（ESCR)为至少500小时。  European Patent No. 1093658B1 discloses an insulating composition using a communication cable, which is at least ー species a - olefin multimodal olefin polymer mixture is more than ー phase polymerization obtained, and having about 0. 920-0. 965 g / cc density, about 0. 2-5 g / 10 min melt flow rate (MFR2), FRR21 / 2 San 60, and should be based on ASTMD1693 (a / 10% Igepal) of the anti-environment ka cracking (the ESCR) of at least 500 hours. 该烯烃聚合物混合物包含至少第一和第二烯烃聚合物，其中第一烯烃聚合物选自（a)密度为大约0.925-0. 975克/立方厘米且熔体流速（MFR2)为大约300-20000克/10分钟的低分子量烯烃聚合物，和(b)密度为大约0. 880-0. 950克/立方厘米且熔体流速（MFR21)为大约0. 5-20克/10分钟的高分子量烯烃聚合物。 The olefin polymer mixture comprises at least a first and a second olefin polymer, wherein the first olefin polymer is selected from (a) a density of about 0.925-0. 975 g / cc and a melt flow rate (the MFR2) of about 300 20,000 g / 10 min and a low molecular weight olefin polymer, and (b) a density of about 0. 880-0. 950 g / cc and a melt flow rate (MFR21 of) from about 0. 5-20 g / 10 min high the molecular weight of olefin polymers. 欧洲专利申请No. 1359192A1公开了包含44至55重量％高分子量聚こ烯部分和45至56重量％低分子量聚こ烯部分的聚こ烯树脂。  European Patent Application No. 1359192A1 discloses a polyethylene resin comprising an ethylenically ko 44-55 wt% of high molecular weight polyethylene ko alkenyl moiety and from 45 to 56 wt% of low molecular weight poly alkylene moiety ko. 闻分子量聚こ烯部分包含密度为0. 913至0. 923克/立方厘米且HLMI为0. 02至0. 2克/10分钟的线型低密度聚こ烯；且低分子量聚こ烯部分包含密度为至少0. 969克/立方厘米且MI2大于100克/10分钟的高密度聚こ烯。 Ko smell molecular weight alkenyl moiety comprises a density of from 0.913 to 0.923 g / cc and an HLMI from 0.02 to 0.2 g / 10 min linear low density polyethylene ko alkenyl; and low molecular weight poly alkylene portion ko comprising a density of at least 0.969 g / cc and a MI2 of greater than 100 g / 10 min and a high density polyethylene ko-ene. 美国专利4，461，873(*.BEP0100843B1)公开了高分子量こ烯聚合物（优选こ烯-单-I-烯烃共聚物）和低分子量こ烯聚合物（优选こ烯均聚物）的こ烯聚合物共混物，两者优选都具有窄分子量分布和低的长链支化度。  U.S. Patent No. 4,461,873 (. * BEP0100843B1) discloses high molecular weight diene polymer ko (ko preferably alkenyl - -I- mono-olefin copolymer) and low molecular weight diene polymer ko (ko preferably homopolymer ) is ko olefin polymer blend, preferably both have a narrow molecular weight distribution and a low degree of long chain branching. 这些树脂可用于、制造薄膜或用在吹塑技术和管材和线材涂层的制造中。 These resins may be used, or in the blow-molding manufacturing a thin film technology and manufacturing of pipes and wire coating. 美国专利6，946，521公开了包含35至49重量％的第一高分子量聚こ烯部分和51至65重量％的第二低分子量聚こ烯部分的聚こ烯树脂。  U.S. Patent No. 6,946,521 discloses a first high molecular weight comprising 35 to 49 wt% of poly ko alkenyl moiety and from 51 to 65 wt% of a second low molecular weight poly ko ko alkenyl moiety terpene resins. 该第一聚こ烯具有最多0. 930克/立方厘米的密度和小于0. 6克/10分钟的HLMI，该第二聚こ烯部分包含具有至少0. 969克/立方厘米的密度和大于10克/10分钟的MI2的高密度聚こ烯，且该聚こ烯树脂具有大于0. 946克/立方厘米的密度，I至100克/10分钟的HLMI，大于200，OOOPa. s的在0. 01弧度/秒下测得的动态粘度，和大于8的分别在0. 01和I弧度/秒下测得的动态粘度比率。 The first poly ko alkenyl having up to 0.930 g / cc density and less than 0.6 g / 10 min HLMI, the second polyethylene having a density ko alkenyl portion contains at least 0.969 g / cc and greater than high density polyethylene alkenyl ko 10 g / 10 min MI2, and the poly terpene resins having ko greater than a density of 0.946 g cm /, the I to 100 g / 10 min HLMI of, greater than 200, OOOPa. s at a dynamic viscosity measured at 0.01 rad / sec, respectively, and measured at 0.01 rad and I / s dynamic viscosity ratio greater than 8. 国际公开NO.W02005/103100公开了包含こ烯均聚物和こ烯与a-烯烃的共聚物的聚こ烯，其具有6至100的摩尔量分布宽度Mw/M ；0. 89至0. 97克/立方厘米的密度；5，000克/摩尔至700，000克/摩尔的重均分子量，Mm，并具有每1000个碳原子0. 01至20个分支，和每1000个碳原子至少0. 5个こ烯基。  International Publication NO.W02005 / 103100 discloses a polyethylene-containing, ethylenically ko ko ko-ene homopolymers and copolymers with a- olefin, having a 6-100 molar amount distribution width Mw / M;. 0 89 cc to a density of 0.97 g /; 5,000 g / mole to 700,000 grams per mole weight / weight average molecular weight, of Mm, and having per 1000 carbon atoms, 0.01 to 20 branches per 1000 carbon atoms of at least 0.5 alkenyl groups ko. 5-50重量％的具有最低摩尔量的聚こ烯具有每1000个碳原子小于10个分支的支化度，5-50重量％的具有最高摩尔量的聚こ烯具有每1000个碳原子多于2个分支的支化度。 5-50% by weight of polyethylene having the lowest molar amount ko alkenyl having a degree of branching of less than 10 branches per 1000 carbon atoms, 5-50% by weight of polyethylene having the highest molar amount ko alkenyl having multiple per 1000 carbon atoms the degree of branching in the two branches. 量，和0. 5至10重量％的共聚单体含量。 Amount, and 0.5 to 10 wt% comonomer content. 欧洲专利申请No. 1333040A2公开了包含高分子量组分（HMW)和低分子量组分(LMW)的聚烯烃，LMW组分构成该聚烯烃的20至80重量％，HMW组分构成该聚烯烃的15至75重量％，并具有小于10的Mw/Mn。  European Patent Application No. 1333040A2 discloses a composition comprising a high molecular weight component (HMW) and low molecular weight component (LMW) a polyolefin, LMW component forming 20 to 80 weight of the polyolefin%, HMW component constituting the the polyolefin 15 to 75 weight percent, and less than 10 Mw / Mn. 该聚烯烃具有大于[0. 024 X (20，000+nQ.Q5)a5]-2. 6 (其中n Q.Q5是在0. 05s-1剪切速率下的熔体粘度（Ns/m2))的熔体强度；且高■组分与低■组分的峰值分子量的比率高于2。 The polyolefin has greater than [0. 024 X (20,000 + nQ.Q5) a5] -2. 6 (where n Q.Q5 a melt viscosity at a shear rate of 0. 05s-1 to (Ns / m2 )) melt strength; and the ratio of peak molecular weight component and the high-low ■ ■ than 2 components. 欧洲专利申请No. 1319685A1公开了具有多峰分子量分布的聚こ烯树脂的制备方法，其包括下列步骤：（i)提供第一高分子量的，金属茂制成的线型低密度聚こ烯（mLLDPE)树脂，其具有0. 920至0. 940克/立方厘米的密度和0. 05至2克/10分钟的HLMI ； (ii)提供用齐格勒纳塔或用铬基催化剂制成的第二高密度聚こ烯（HDPE)，所述聚こ烯具有0. 950至0. 970克/立方厘米的密度和5至100克/10分钟的HLMI ； (iii)将第一和第二聚こ烯物理共混在一起以形成具有半高分子量、宽或多峰分子量分布、0. 948至0. 958克/立方厘米的密度和2至20克/10分钟的HLMI的聚こ烯树脂。  European Patent Application No. 1319685A1 discloses the preparation of poly ko terpene resins having a multimodal molecular weight distribution, comprising the steps of: (i) providing a first high molecular weight metallocene-produced linear low density polyethylene ko-ene (mLLDPE) resin having from 0.920 to 0.940 grams / cubic centimeter and a density of 0.05 to 2 g / 10 min HLMI; (ii) providing a Ziegler-Natta or with a chromium based catalyst made of a second high-density polyethylene ko-ene (HDPE), the poly ko alkenyl having from 0.950 to 0.970 g cm3, / and 5 to 100 g / 10 min HLMI; (iii) a first poly-ene and a second physical blending together to form a semi-ko high molecular weight, a broad or multimodal molecular weight distribution, .948-.958 g / cm3, and from 2 to 20 g / 10 min HLMI poly ko terpene resins. 美国专利6，749，914公开了管材和配件材料所用的熔体共混HDPE，其具有0. 945至0. 955克/立方厘米的密度，根据ASTM D1238小于0. 4的熔体流动指数值，并具有提高的物理性能和エ艺特性。  U.S. Patent No. 6,749,914 discloses a melt blended HDPE pipe and fittings materials used, which has a density of from 0.945 to 0.955 g / cc, a melt of less than 0.4 according to ASTM D1238 flow index value and has improved physical properties and characteristics Ester arts. 美国专利4，525，322公开了用于吹塑法的聚こ烯共混物，其包含12至25重量％的闻分子量组分、5至83重量％的中分子量组分、5至83重量％的低分子量组分。  U.S. Patent No. 4,525,322 discloses a blend of a poly alkylene ko for blow molding, comprising 12 to 25 wt% of smell molecular weight component, 5 to 83 wt% of the molecular weight component, 5 to 83% by weight of the low molecular weight component. 闻分子量与中分子量的比率大于或等于I. 7，且中分子量与低分子量的比率大于或等于I. 7,且该共混物具有0. 01至2. 0的熔体指数。 Wen molecular weight ratio of a molecular weight greater than or equal to I. 7, and the ratio of the low molecular weight and a molecular weight greater than or equal to I. 7, and the blend has a melt index of from 0.01 to 2.0. 国际公开No. W000/18813公开了具有多峰分子量分布的聚こ烯树脂的制备方法，该方法包括（i)使こ烯单体和包含具有3至10个碳原子的a -烯烃的共聚单体与第一催化剂体系在第一反应器中在第一聚合条件下在淤浆法中接触，以制造具有第一分子量、不大于0. 5克/10分钟的HLMI和不大于0. 925克/毫升的第一密度的第一聚こ烯；（ii)提供具有第二较低分子量和比第一聚こ烯高的密度的第二聚こ烯；和（iii)将第一和第二聚こ烯混合在一起以形成具有多峰分子量分布的聚こ烯树脂。  International Publication No. W000 / 18813 discloses a process for preparing poly ko terpene resins having a multimodal molecular weight distribution, which method comprises (i) contacting ko comprising a monomer and having from 3 to 10 carbon atoms - olefin comonomer to the first catalyst system in a first reactor under first polymerization conditions in a slurry process, to produce a first having a molecular weight of no greater than 0.5 g / 10 min and HLMI of not more than 0 the first density of 925 g / ml ko first poly-ene; (ii) providing a second polyethylene having a second lower molecular weight alkenyl ko and higher than the first density polyethylene ko alkenyl; and (iii) a first and a second poly-ene ko ko mixed together to form the poly terpene resins having a multimodal molecular weight distribution. 、 日本专利JP2001226496A (摘要）公开了由包含98-55重量％的具有0. 93-0. 97克/立方厘米密度的こ烯均聚物或こ烯-a -烯烃共聚物和2-45重量％的符合0. 86-0. 94克/立方厘米密度、0. 01-50克/10分钟熔体流速和I. 5-4. 5分子量分布（Mw/Mn)的要求的こ烯共聚物的树脂组合物获得的聚こ烯树脂片。 ,  Japanese Patent No. JP2001226496A (Abstract) discloses a ko alkenyl having 0. 93-097 g / cc density comprises 98-55% by weight of a homopolymer or alkenyl ko -a -. 2 olefin copolymer and 45% by weight of 0. 86-0 compliance. 94 g / cc density, requires 0. 01-50 g / 10 min and a melt flow rate I. 5-4. 5 the molecular weight distribution (Mw / Mn) of ko poly-terpene resins ko copolymer resin composition was obtained. 国际公开No. W02004/016688公开了具有0. 945至0. 960克/立方厘米的密度和0. I至0. 4的熔体流动指数的聚こ烯组合物。  International Publication No. W02004 / 016688 discloses a density and a melt flow index of 0. I to 0.4 poly ko ene compositions having 0.945 to 0.960 g / cc. 该组合物是线型低密度聚こ烯树脂和/或线型中低密度聚こ烯树脂和高密度聚こ烯树脂的熔体共混物。 The composition is a linear low density polyethylene ko terpene resins and / or linear low density polyethylene resins and alkenyl ko ko high-density polyethylene resin melt blend alkenyl. 另ー些聚こ烯基组合物公开在美国专利6，809，154 ;美国专利4，617，352 ;美国专利6，541,581 ;美国专利6, 090, 893 ;美国专利5,310,834 ;美国专利6，649，698 ;美国专利4，603，173 ;美国专利7，129，296 ;美国专利5，688，865 ;美国公开No. 2005/0288443 ；美国公开No. 2003/0149181 ;国际公开No. W02004/058878 ;国际公开No. W02004/058877 ；国际公开No. W02004/058876 ;国际公开No. W099/65039 ;和国际公开No. WOO1/79344 (也參见EP1146077A);国际公开No. W02005/121239 ;国际公开No. W096/18677 ;国际公开No. W02004/007610 ;国际公开No. W001/14122 ；欧洲申请No. 1384751A1 ；欧洲申请No. 1595897A1 ;和欧洲申请No. 0717055A2 中。  Another poly ko alkenyl ー these compositions are disclosed in U.S. Patent No. 6,809,154; U.S. Patent No. 4,617,352; U.S. Patent No. 6,541,581; U.S. Patent No. 6,090, 893; U.S. Patent No. 5,310,834; U.S. Pat. 6,649,698; US Patent 4,603,173; US Patent 7,129,296; US Patent 5,688,865; US Publication No. 2005/0288443; US Publication No. 2003/0149181; international Publication No. W02004 / 058878; international Publication No. W02004 / 058877; international Publication No. W02004 / 058876; international Publication No. W099 / 65039; and international Publication No. WOO1 / 79344 (see also EP1146077A); international Publication No. W02005 / 121239 ; international Publication No. W096 / 18677; international Publication No. W02004 / 007610; international Publication No. W001 / 14122; European application No. 1384751A1; European application No. 1595897A1; and in European application No. 0717055A2. 但是，仍然需要可以提供硬度、抗应カ开裂性和抗冲击性的最佳平衡的聚烯烃组合物。  However, there remains a need provide hardness, cracking should polyolefin composition and grades the best balance of impact resistance. 这种需要在吹塑的家用和エ业容器的制造中，尤其是在还原树脂、轻型硬质容器领域中特别显著。 This requires the manufacture of blow molded household and Ester container industry, particularly in the reduction of the resin, in the field of lightweight rigid containers particularly significant. 通过下列发明，解决了这些问题中的ー些和其它问题。 By the following invention to solve these and other problems ー these problems. 已经发现了使树脂硬度、抗应カ开裂性和抗冲击性改进的基础树脂结构修正。  It has been found that the resin of hardness, crack resistance and ka should improve the impact resistance of the base resin structure refinement. 通过将最佳量的高分子量こ烯基共聚体与低分子量こ烯基均聚物或含低量的ー种或多种共聚单体的共聚体组合，实现这种修正。 By an optimum amount of high molecular weight alkenyl ko low molecular weight interpolymer and a homopolymer or a ko alkenyl group-containing low amounts of one or more comonomers ー interpolymer combination of monomers, to achieve this correction. 所得聚合物具有通过弯曲模量表征的硬度、通过抗环境应カ开裂性表征的韧度和通过悬臂梁式冲击表征的冲击强度的优异平衡。 The resulting polymer has a hardness characterized by flexural modulus, an excellent balance of environmental cracking resistance characterized by an anti-ka should toughness and characterized by Izod impact strength of the impact. 相应地，本发明提供了用于吹塑用途和其它用途的组合物，其中这类组合物包含高分子量こ烯共聚体组分和低分子量こ烯聚合物组分。  Accordingly, the present invention provides compositions for blow molding applications and other applications, where such compositions comprise a high molecular weight component and a low molecular weight substance ko ko copolymerized ethylenically-ene polymer component. 如上所述，本发明提供了包含高分子量组分和低分子量组分的组合物，且其中高分子量组分包含密度为0. 920克/立方厘米至0. 950克/立方厘米且I21为0. 05至I分克/分钟的こ烯共聚体，且其中低分子量组分包含密度为0. 965克/立方厘米至0. 985克/立方厘米且I2为600至2000分克/分钟的こ烯聚合物，且其中该组合物具有0. 950克/立方厘米至0. 970克/立方厘米的密度，并包含45至80重量％的高分子量组分和55至20重量％的低分子量组分，其中重量百分比基于高分子量组分和低分子量组分的总重量。  As described above, the present invention provides a composition comprising a high molecular weight component and the low molecular weight component, and wherein the high molecular weight component having a density of 0.920 g / cc to 0.950 g / cc and I21 is I to 0.05 dg / min ko alkylene interpolymer, and wherein the low molecular weight component having a density of 0.965 g / cc to 0.985 g / cc and I2 of from 600 to 2000 g / ko minutes olefin polymer, and wherein the composition has a 0.950 g / cc to 0.970 g cm3, /, and comprising 45 to 80% by weight of the high molecular weight component and 55 to 20% by weight low molecular weight component, wherein the weight percentages are based on the high molecular weight component and the total weight of the low molecular weight component. 在另一具体实施方案中，高分子量组分仅包含こ烯共聚体。 In another embodiment, the high molecular weight component comprises only ko alkylene interpolymer. 在另一具体实施方案中，低分子量组分仅包含こ烯聚合物。 In another embodiment, the low molecular weight component comprises only ko olefin polymers. 在本发明的ー个方面中，该组合物具有3至15分克/分钟的121。  In ー aspect of the present invention, the composition has 3 to 15 dg / min to 121. 在本发明的另一方面中，该组合物包含50至75重量％的高分子量组分和25至50重量％的低分子量组分。 In another aspect of the present invention, the composition comprises 50 to 75% by weight of the high molecular weight component and from 25 to 50 wt% of low molecular weight component. 另ー方面，高分子量こ烯共聚体具有0. 925克/立方厘米至0. 950克/立方厘米的密度。ー another aspect, the high molecular weight copolymer having ethylenically ko 0.925 g / cc to a density of 0.950 g / cc. 又一方面，该组合物具有0.955克/立方厘米至0.970克/立方厘米的密度。 In yet another aspect, the composition has a density of 0.955 g / cc to 0.970 g / cc. 另一方面，高分子量こ烯聚合物具有0. 10至0. 50分克/分钟的I21。 On the other hand, the high molecular weight olefin polymer having ko 0.10 to 0.50 dg / min I21. 在本发明的ー个方面中，该组合物具有5至7分克/分钟的121。  In ー aspect of the present invention, the composition has 5 to 7 dg / min to 121. 另ー方面，该组合物包含55至65重量％的高分子量组分和35至45重量％的低分子量组分。ー another aspect, the composition comprises 55 to 65 weight percent of the high molecular weight component and from 35 to 45 wt% of low molecular weight component. 另ー方面，该组合物具有0. 955至0. 960克/立方厘米的密度。ー another aspect, the composition has a density of 0.955 to 0.960 g / cc. 另ー方面，高分子量こ烯共聚体具有0. 935克/立方厘米至0. 945克/立方厘米的密度。ー another aspect, the high molecular weight copolymer having ethylenically ko 0.935 g / cc to a density of 0.945 g / cc. 另ー方面，高分子量こ烯聚合物具有0. 20至0. 40分克/分钟的121。ー another aspect, the high molecular weight olefin polymer having ko from 0.20 to 0.40 dg / min to 121. 另ー方面，低分子量こ烯聚合物具有0. 965克/立方厘米至0. 975克/立方厘米的密度。ー another aspect, the low molecular weight olefin polymer having a density ko 0.965 g / cc to 0.975 g / cc. 另ー方面，低分子量こ烯聚合物具有700至1150分克/分钟的I21。ー another aspect, the low molecular weight olefin polymer having ko 700-1150 dg / min I21. 在本发明的另一方面中，该组合物具有3至15分克/分钟的121。  In another aspect of the present invention, the composition has 3 to 15 dg / min to 121. 在本发明的另一方面中，闻分子量こ烯共聚体具有I. 5至10的分子量分布Mw/Mn。 In another aspect of the present invention, the molecular weight of the smell ko alkylene interpolymer has a molecular weight distribution I. 5 to 10. The Mw / Mn. 另一方面,低分子量こ烯聚合物是均聚物。 On the other hand, low-molecular weight olefin polymer is a homopolymer ko. 另ー方面，高分子量こ烯共聚体是こ烯/a-烯烃共聚体。ー another aspect, the high molecular weight copolymer is ko ko alkenyl ene / a- olefin interpolymer. 另ー方面，a -烯经是C3-C2tl烯经，并优选为C3-Cltl烯经。ー another aspect, a - alkenyl is C3-C2tl alkenyl via through, and is preferably C3-Cltl alkenyl over. 另一方面，a -烯经选自丙烯、I- 丁烯、1_戍烯、I-己烯、3-甲基-I-戍烯、4-甲基-I-戍烯、I-庚烯、I-辛烯、I-壬烯和I-癸烯，并优选为丙稀、1_ 丁稀、1_己稀和1_羊稀。 On the other hand, a - ene was selected from propylene, I- butene, pentene 1_, I- hexene, 3-methyl -I- pentene, 4-methyl pentene -I-, I- heptyl alkenyl, I- octene, nonene and I- I- decene, and preferably propylene, but-lean 1_, 1_ 1_ hexene and dilute sheep. 在本发明的另一方面中，高分子量こ烯共聚体以大于或等于高分子量和低分子量组分总重量的55重量％的量存在，和/或低分子量こ烯聚合物以小于或等于高分子量和低分子量组分总重量的45重量％的量存在。  In another aspect of the present invention, the high molecular weight copolymer of ethylenically ko amount greater than or equal to 55 and the molecular weight of the total weight percent of the low molecular weight component is present, and / or low molecular weight olefin polymer of less than ko present in an amount equal to 45% by weight or high molecular weight and low molecular weight components of the total weight. 另一方面,低分子こ烯聚合物具有700至1,000分克/分钟或700至1，200分克/分钟的I2值。 On the other hand, low molecular weight olefin polymer having ko 700 to 1,000 dg / min, or 700 to 1,200 dg / min I2 value. 在本发明的另一方面中，低分子量こ烯聚合物是こ烯/a-烯烃共聚体。  In another aspect of the present invention, the low molecular weight olefin polymer is ko ko ethylenically / a- olefin interpolymer. 另一方面，a-烯烃是C3-C2tl烯烃，并优选为C3-Cltl烯烃。 On the other hand, the olefin is a C3-C2tl A- olefins, and preferably C3-Cltl olefins. 另ー方面，a-烯烃选自丙烯、I-丁烯、I-戍烯、1_己烯、3-甲基-I-戍烯、4-甲基-I-戍烯、I-庚烯、I-辛烯、I-壬烯和I-癸烯，并优选为丙烯、I-丁烯、I-己烯和I-辛烯。 Another aspect ー, A- olefin selected from propylene, I- butene, I- pentene, hexene 1_, -I- 3-methyl pentene, 4-methyl pentene -I-, I- heptene , I- octene, nonene and I- I- decene, and preferably propylene, butene I-, I- I- hexene and octene. 本发明还提供了包含至少ー个由本发明的组合物形成的部件的制品。  The present invention further provides ー a member formed from the composition of the present invention comprises at least an article. 另ー方面，本发明提供了包含至少ー个由本发明的组合物形成的部件的吹塑制品。ー another aspect, the present invention provides ー a member formed from the composition of the present invention comprises at least a blow molded article. 本发明还提供了如本文所述形成制品（例如，吹塑本发明的组合物）的方法。 The present invention further provides a method of forming an article as described herein (e.g., blow molding a composition according to the present invention). 另ー方面，木发明还提供了如本文所述具有一种或多种下列性质的制品或树脂：大于5000psi的极限抗拉强度、大于500小时的ESCR F50，和/或大于190，OOOpsi的I %割线模量。ー another aspect, the invention also provides a timber as described herein having one or more of the following properties of the resin or article: ultimate tensile strength greater than 5000psi is greater than 500 hours ESCR F50, and / or greater than 190, OOOpsi the I % secant modulus. 本发明还提供了制造本发明的组合物的方法。  The present invention further provides a method for producing a composition according to the present invention. 一方面，本发明提供了包括在双反、应器中使该组合物聚合的方法，且其中高分子量こ烯共聚体在第一反应器中形成，低分子量こ烯聚合物在第二反应器中形成。 In one aspect, the present invention provides a dual included, the composition should polymerization method manipulation device, and wherein the high molecular weight interpolymer ko alkenyl formed in the first reactor, a low molecular weight olefin polymer ko in the second reactor formed. 在另一具体实施方案中，低分子量こ烯共聚体在第一反应器中形成，且高分子量こ烯聚合物在第二反应器中形成。 Low molecular weight alkenyl ko copolymer formed in the first reactor In another specific embodiment, ko and the high molecular weight olefin polymer formed in the second reactor. 另ー方面，该双反应器以串联构造运行。ー another aspect, the dual reactors operated in a series configuration. 再一方面，各组分的聚合在气相中进行。 Another aspect, the polymerization of each component in the gas phase. 另ー方面，高分子量组分和/或低分子量组分使用镁-钛催化剂体系，如齐格勒-纳塔催化剂体系形成。ー another aspect, the high molecular weight component and / or low molecular weight component using a magnesium - titanium catalyst system, such as a Ziegler - Natta catalyst system is formed. 再一方面，镁-钛催化剂体系为喷雾干燥形式。 In another aspect, a magnesium - titanium catalyst system is in spray dried form. 本发明提供了可用于制造吹塑制品和其它产品的こ烯聚合物组合物。  The present invention provides ko olefin polymer composition may be used to manufacture blow molded articles and other products. 这些树脂表现出硬度、抗环境应カ开裂性和冲击强度的优异平衡。 These resins exhibit hardness, resistance to environmental grades should excellent balance of impact strength and crack resistance. 如上所述，该组合物包含高分子量低密度こ烯共聚体和低分子量高密度こ烯聚合物。 As described above, the composition comprising a high molecular weight low density alkylene interpolymer ko and low molecular weight high density olefin polymers ko. 可用于こ烯共聚体的合适的共聚单体包括但不限于，烯键式不饱和単体、共轭或非共轭ニ烯或聚烯，及其混合物。  Suitable ethylenically ko can be used comonomers include, but are not limited to body, ethylenically unsaturated radiolabeling thereof, conjugated or non-conjugated polyene Ni or alkenyl, and mixtures thereof. 这类共聚单体的实例包括C3-C2tl a-烯烃，如丙烯、异丁烯、I- 丁烯、1_戍烯、1_己烯、3-甲基-I-戍烯、4-甲基-I-戍烯、I-庚烯、I-辛烯、I-壬烯、I-癸烯，并优选为丙烯、I-丁烯、I-己烯和I-辛烯。 Examples of such comonomers include C3-C2tl a- olefins such as propylene, isobutylene, I- butene, pentene 1_, 1_ hexene, 3-methyl -I- pentene, 4-methyl - I- pentene, heptene I-, I- octene, nonene I-, I- decene, and preferably propylene, butene I-, I- I- hexene and octene. C3-C2tl a-烯烃的优选实例包括丙烯、I- 丁烯、I-戍烯、I-己烯、3-甲基-I-戍烯、4-甲基-I-戍烯、I-庚烯、I-辛烯、I-壬烯和I-癸烯。 Preferable examples of the C3-C2tl a- olefins include propylene, I- butene, I- pentene, I- hexene, 3-methyl -I- pentene, 4-methyl pentene -I-, I- heptyl alkenyl, I- octene, I- I- nonene and decene. 从3个碳原子到20个碳原子的所有单个数值和子范围都包含并公开在本文中。 From 3 carbon atoms to all individual values ​​and subranges 20 carbon atoms are included herein and disclosed herein. 优选的共聚单体包括丙烯、I- 丁烯、I-己烯、4-甲基-I-戊烯、I-辛烯及其混合物。 Preferred comonomers include propylene, I- butene, I- hexene, 4-methyl pentene -I-, I--octene, and mixtures thereof. 其它合适的单体包括苯こ烯、卤代苯こ烯、烷基取代的苯こ烯、四氟こ烯、こ烯基苯并环丁烷、丁ニ烯、异戊ニ烯、戊ニ烯、己ニ烯（例如1，4_己ニ烯）、辛ニ烯、环烯（例如，环戊烯、环己烯和环辛烯）和其它环烷烃。 Other suitable monomers include ethylenically ko benzene, halobenzene ko alkenyl, alkyl-substituted benzenes ko alkenyl, alkenyl tetrafluoroethylene ko, ko alkenylbenzene and cyclobutane, but-ene ni, ni isoamyl ene, pent-ni-ene , hexyl ni alkenyl (e.g. Ni-ene 1,4_ hexyl), alkenyl oct-ni, cycloolefin (e.g., cyclopentene, cyclohexene and cyclooctene) and other cycloalkanes. 通常，こ烯与ー种C3-C2tl a-烯烃共聚。 Typically, ko alkylene ー kinds C3-C2tl a- olefin copolymer. 优选的C3-C8 a-烯烃包括但不限于，丙烯、I- 丁烯、I-戍烯、3-甲基-I-戍烯、4-甲基-I-戍烯、I-己烯、I-庚烯和I-羊烯，并优选为丙烯、1_ 丁烯、I-己烯和I-羊烯。 Preferred C3-C8 a- olefins, including but not limited to, propylene, I- butene, I- pentene, 3-methyl -I- pentene, 4-methyl pentene -I-, I- hexene, I- I- sheep alkenyl and heptenyl, and preferably propylene, butene 1_, sheep and I- I- hexene-ene. 在本发明的优选具体实施方案中，高分子量组分和/或低分子量组分是不均匀支化的线型共聚体。  In a preferred embodiment of the present invention specific embodiments, the high molecular weight component and / or low molecular weight component is a heterogeneously branched linear interpolymer. 这类共聚体可以由齐格勒-纳塔型催化剂体系制备。 Such interpolymers may be made of Ziegler - Natta catalyst system. 这类共聚体不以基本均匀的共聚单体分布（其中基本所有聚合物分子都具有相同的こ烯-共聚单体比率）为特征。 Such interpolymers are not substantially uniform comonomer distribution (wherein substantially all of the polymer molecules have the same ethylenically ko - comonomer ratio) characteristics. 在另一具体实施方案中，高分子量组分和/或低分子量组分是均匀支化的线型或均匀支化的基本线型こ烯/ a -烯烃共聚体，其特征在于具有基本均匀的共聚单体分布。  In another embodiment, the high molecular weight component and / or low molecular weight component is a homogeneously branched linear or homogeneously branched substantially linear alkenyl ko / a - olefin interpolymer, characterized as having a substantially uniform comonomer distribution. 在美国专利 No. 5，206，075 ;美国专利No. 5，241，031 ;和PCT 公开申请W093/03093中公开了制备均匀聚合物的方法；它们各自完全经此引用并入本文。  In U.S. Pat. No. 5,206,075; U.S. Pat. No. 5,241,031; and PCT Published Application W093 / 03093 discloses a process for preparing a homogeneous polymer; each of which are fully incorporated herein by reference . 关于均匀こ烯a -烯烃共聚物的制造和应用的进ー步细节公开在美国专利No. 5，206，075 ;美国专利No. 5，241,031 ;PCT国际公开号W093/03093 ;PCT国际公开号W090/03414中；所有这四个专利完全经此引用并入本文。 Ko alkenyl uniformly on a - further into the details of the manufacture and use ー olefin copolymers are disclosed in U.S. Pat. No. 5,206,075; U.S. Pat. No. 5,241,031; PCT International Publication No. W093 / 03093; PCT International Publication Number in W090 / 03414; all four patents are fully incorporated herein by reference. 可以使用受限几何催化剂制备均匀共聚体。 Geometry may be used to prepare a uniform catalyst interpolymers limited. 受限几何催化剂的实例描述在美国专利Nos. 5，272，236和5，278，272中，它们各自完全经此引用并入本文。 Examples of constrained geometry catalysts described in U.S. Patent Nos. 5,272,236 and 5,278,272, each fully incorporated herein by reference. 在另ー些具体实施方案中，高分子量组分是如美国公开No. 20030055176和美国公开No. 20040198911(它们各自完全经此引用并入本文）中所述的以具有反向共聚单体分布为特征的こ烯/ a -烯烃共聚体。  In some other particular embodiments ー embodiment, the high molecular weight component is as described in US Publication No. 20030055176 and U.S. Publication No. 20040198911 (each of which are fully incorporated herein by reference) according to has a reverse comonomer It characterized the distribution of body alkenyl ko / a - olefin interpolymer. 共聚体组分中较高量的共聚单体包含在共聚体组合物的高分子量部分中。 Interpolymer component comprises a higher amount of comonomer in the high molecular weight portion of the interpolymer composition. 也就是说，Mw大于或等于共聚体组分的平均Mw的聚合物部分的特征在干，具有比Mw小于共聚体组分平均Mw的聚合物部分高的重均共聚单体量。 That is, the polymer moiety wherein Mw is equal to or greater than the average Mw copolymer in the dry ingredients thereof, having a weight ratio of high Mw polymer portion is less than the average Mw of the interpolymer component average amount of comonomer. 本发明的组合物可以包含本文所述的两个或多个方面/具体实施方案的组合。  The compositions of the invention may comprise two or more aspects described herein / combining specific embodiments. 低分子量组分可以包含本文所述的两个或多个方面/具体实施方案的组合。  The low molecular weight component may comprise a combination of two or more aspects described herein / the specific embodiments. 通常，该组合物含有45至80重量0Z0，优选50至75重量0Z0，更优选55至75重量0Z0，再更优选55至70重量％的高分子こ烯共聚体组分。  Generally, the composition contains 45 to 80 wt 0Z0, preferably 50 to 75 wt 0Z0, more preferably 55 to 75 weight 0Z0, still more preferably 55 to 70% by weight of a polymer component ko alkylene interpolymer. 在另一具体实施方案中，高分子量组分的量为55至65重量％。 In another particular embodiment, the amount of high molecular weight component is 55 to 65 wt%. 从45到80重量％的所有单个数值和子范围都包含并公开在本文中。 From All individual values ​​and subranges from 45 to 80% by weight are included herein and disclosed herein. 重量百分比基于高分子量和低分子量组分的总重量。 Weight percent based on the total weight of the high molecular weight and low molecular weight components. 在另一具体实施方案中，高分子量组分以高分子量和低分子量组分总重量的大于或等于50重量％，优选大于或等于55重量％，更优选大于或等于60重量％的量存在。  In another embodiment, the high molecular weight component to high molecular weight and low molecular weight components of the total weight of greater than or equal 50 wt%, preferably greater than or equal to 55 wt%, more preferably greater than or equal to 60% by weight present in an amount. 在另一具体实施方案中，高分子量组分以高分子量和低分子量组分总重量的小于或等于80重量％，优选小于或等于75重量％，更优选小于或等于70重量％的量存在。 In another particular embodiment, the high molecular weight component is less than or equal to high and low molecular weight components of the total weight of the 80 wt%, preferably less than or equal to 75 wt%, more preferably less than or equal to 70% by weight. 在另一具体实施方案中，闻分子量组分的重均分子量（Mw)优选为100，000至500，000克/摩尔，更优选200，000至400，000克/摩尔，再更优选250，000至350，000克/摩尔。  In another embodiment, the weight average molecular weight component smell (Mw) of preferably from 100,000 to 500,000 g / mol, more preferably from 200,000 to 400,000 g / mol, and even more preferably 250,000 to 350,000 g / mol. 从100，000到500，000克/摩尔的所有单个数值和子范围都包含并公开在本文中。 From 100,000 to 500,000 g / All individual values ​​and subranges are included herein and disclosed mole herein. 在另一具体实施方案中，高分子量组分的数均分子量（Mn)优选为50，000至200，000克/摩尔，更优选为60，000至150，000克/摩尔，再更优选为70，000至100，000克/摩尔。  In another particular embodiment, number average molecular weight component (Mn) of preferably from 50,000 to 200,000 g / mol, more preferably from 60,000 to 150,000 g / mol, and then more preferably from 70,000 to 100,000 g / mol. 从50，000到200，000克/摩尔的所有单个数值和子范围都包含并公开在本文中。 From 50,000 to 200,000 g / All individual values ​​and subranges are included herein and disclosed mole herein. 在另一具体实施方案中，闻分子量组分的分子量分布Mw/Mn优选为I. 5至10,更优选为大于2至8，再更优选为3至6，或4至6。  In another embodiment, the molecular weight distribution smell molecular weight component Mw / Mn is preferably I. 5 to 10, more preferably greater than 2 to 8, even more preferably 3-6, or 4-6. 在另一具体实施方案中，高分子量组分的Mw/Mn大于或等于2. 5,优选大于或等于3. 0,更优选大于或等于3. 5。 In another particular embodiment, Mw / Mn molecular weight component is greater than or equal to 2.5, preferably greater than or equal to 3.0, more preferably greater than or equal to 3.5. 在另一具体实施方案中，高分子量组分的Mw/Mn小于或等于6. 0，优选小于或等于5. 5，更优选小于或等于5. O。 In another particular embodiment, the Mw of the high molecular weight component / Mn less than or equal to 6.0, preferably less than or equal to 5.5, more preferably less than or equal to 5. O. 从I. 5到10的所有单个数值和子范围都包含并公开在本文中。 From all individual values ​​and subranges I. 5 through 10 are included herein and disclosed herein. 在另一具体实施方案中，高分子量组分的密度优选为0. 920至0. 950克/立方厘米，更优选0. 925至0. 950克/立方厘米，再更优选0. 930至0. 945克/立方厘米。  In another embodiment, the high molecular weight component preferably has a density from 0.920 to 0.950 g / cc, more preferably from 0.925 to 0.950 g / cc, still more preferably 0. 930 to 0.945 g / cc. 在另ー具体实施方案中，高分子量组分的密度大于0. 920克/立方厘米，优选大于0. 925克/立方厘米，更优选大于0. 930克/立方厘米。ー In another specific embodiment, the high molecular weight component is greater than the density of 0.920 g / cc, preferably greater than 0.925 g / cc, more preferably greater than 0.930 g / cc. 在另一具体实施方案中，高分子量组分的密度小于0. 950克/立方厘米，优选小于0. 945克/立方厘米。 In another embodiment, the density of the high molecular weight component is less than 0.950 g / cc, preferably less than 0.945 g / cc. 在另一具体实施方案中，密度为0. 932克/立方厘米至0. 942克/立方厘米，且从0. 920克/立方厘米到0. 950克/立方厘米的所有单个数值和子范围都包含并公开在本文中。 All individual values ​​and subranges In another particular embodiment, a density of 0.932 g / cc to 0.942 g / cc, and from 0.920 g / cc to 0.950 g / cc are It included herein and disclosed herein. 在另一具体实施方案中，高分子量组分具有优选为0. 05至I分克/分钟，更优选为0. I至0. 50分克/分钟，再更优选为0. 15至0. 45分克/分钟，最优选为0. 20至0. 40分克/分钟的使用ASTM D-1238(190°C，21. 6千克负荷）测得的高负荷熔体指数（I21)。  In another embodiment, the high molecular weight component has preferably I to 0.05 dg / min, more preferably 0. I to 0.50 dg / min, still more preferably 0.15 to 0.45 dg / min, and most preferably from 0.20 to 0.40 dg / min using ASTM D-1238 (190 ° C, 21. 6 kilogram load) measured by a high load melt index (I21 ). 在另ー具体实施方案中，高分子量组分具有大于或等于0. 05分克/分钟，优选大于或等于0. I分克/分钟，更优选大于或等于0. 2分克/分钟的高负荷熔体指数（I21)。ー particular embodiments, a high molecular weight component is greater than or equal to 0.05 dg / min, preferably greater than or equal to 0. I dg / min, more preferably greater than or equal to 0.2 dg / min in another load melt index (I21). 在另一具体实施方案中，高分子量组分具有小于或等于I分克/分钟，优选小于或等于0. 9分克/分钟，更优选小于或等于0. 8分克/分钟的高负荷熔体指数（I21)。 In another embodiment, the high molecular weight component having less than or equal to I dg / min, preferably less than or equal to 0.9 dg / min, more preferably less than or equal to 0.8 dg / min, a high load melt body index (I21). 从0. 05到I分克/分钟的所有单个数值和子范围都包含并公开在本文中。 From 0.05 to points I All individual values ​​and subranges g / min are included herein and disclosed herein. 在另一具体实施方案中，高分子量组分具有大于或等于40%，优选大于或等于50%，更优选大于或等于60%的通过DSC测得的结晶度百分比。  In another embodiment, the high molecular weight component having greater than or equal to 40%, preferably greater than or equal to 50%, more preferably greater than or equal to percent crystallinity as measured by DSC by 60%. 优选地，这些聚合物具有40%至70%的结晶度百分比，且从40%到80%的所有单个数值和子范围都包含并公开在、本文中。 Preferably, these polymers have a percent crystallinity of 40% to 70%, and from all the individual values ​​and subranges from 40 percent to 80 percent are included herein and disclosed herein. 高分子量组分可以具有来自两个或多个上述具体实施方案的性质的组合。  The high molecular weight component may have a combination of properties from two or more of the above-described specific embodiments. 高分子量组分的合适实例包括使用齐格勒-纳塔催化剂体系、铬基催化剂、单点催化剂，如受限几何催化剂或金属茂基催化剂，和后金属茂催化剂制成的气相树脂。  Suitable examples of high molecular weight component comprises a Ziegler - Natta catalyst systems, chromium-based catalysts, single site catalysts, such as constrained geometry catalysts or metallocene-based catalysts, and gas-phase resin after the metallocene catalyst. 通常，该组合物含有20至55重量0Z0，优选25至50重量0Z0，更优选25至45重量0Z0，再更优选30至45重量％的低分子量こ烯聚合物组分。  Generally, the composition contains 20 to 55 wt 0Z0, preferably 25 to 50 wt 0Z0, more preferably 25 to 45 weight 0Z0, still more preferably 30 to 45 wt% low molecular weight polymer component ko alkenyl. 在另一具体实施方案中，低分子量组分的量为20至40重量％。 In another embodiment, the amount of the low molecular weight component is 20 to 40 wt%. 在另一具体实施方案中，低分子量组分的量为35至45重量％。 In another embodiment, the amount of the low molecular weight component is 35 to 45% by weight. 从20到55重量％的所有单个数值和子范围都包含并公开在本文中。 From 20 to 55 wt. All individual values ​​and subranges percent are included herein and disclosed herein. 重量百分比基于高分子量和低分子量组分的总重量。 Weight percent based on the total weight of the high molecular weight and low molecular weight components. 在另一具体实施方案中，低分子量组分以高分子量和低分子量组分总重量的大于或等于20重量％，优选大于或等于25重量％，更优选大于或等于30重量％的量存在。  In another embodiment, the low molecular weight component to high molecular weight and low molecular weight components of the total weight equal to or greater than 20 wt%, preferably greater than or equal to 25 wt%, more preferably greater than or equal to 30% by weight of present in an amount. 在另一具体实施方案中，低分子量组分以高分子量和低分子量组分总重量的小于或等于50重量％，优选小于或等于45重量％，更优选小于或等于40重量％的量存在。 In another embodiment, the low molecular weight component to high molecular weight and low molecular weight components of the total weight of less than or equal 50 wt%, preferably less than or equal to 45 wt%, more preferably less than or equal to 40% by weight. (I2)，优选具有600至2000分克/分钟，更优选625至1500分克/分钟，再更优选650至1200分克/分钟，最优选700至1150分克/分钟的熔体指数。 (I2), preferably from 600 to 2000 g / min, more preferably from 625 to 1500 dg / min, still more preferably from 650 to 1200 dg / min, most preferably from 700 to 1150 dg / min melt index. 在另一具体实施方案中，低分子量组分具有1100至2000分克/分钟，优选1200至1800分克/分钟的熔体指数（I2)。 In another embodiment, the low molecular weight component having a 1100 to 2000 dg / min, preferably from 1200 to 1800 dg / min melt index (I2). 从600到2000分克/分钟的所有单个数值和子范围都包含并公开在本文中。 From All individual values ​​and subranges from 600 to 2000 dg / min are included herein and disclosed herein. 在另一具体实施方案中，低分子量组分具有小于100，000克/摩尔的重均分子量。  In another embodiment, the low molecular weight component having a weight of less than 100,000 g mol / average molecular weight. 在另一具体实施方案中，重均分子量为2，000至100，000克/摩尔，更优选5，000至70，000克/摩尔，最优选10，000至50，000克/摩尔。 In another embodiment, the weight average molecular weight of 2,000 to 100,000 g / mol, more preferably from 5,000 to 70,000 g / mol, most preferably from 10,000 to 50,000 g / mol. 从2，000克/摩尔到100，000克/摩尔的所有单个数值和子范围都包含并公开在本文中。 From 2,000 g / mole to 100,000 g / All individual values ​​and subranges are included herein and disclosed mole herein. 在另一具体实施方案中，低分子量组分具有小于50，000克/摩尔的数均分子量。  In another embodiment, the low molecular weight component has a number of less than 50,000 g / mol average molecular weight. 在另一具体实施方案中，数均分子量为500至50，000克/摩尔，更优选1，000至30，000克/摩尔，最优选1，500至20，000克/摩尔。 In another particular embodiment, number average molecular weight of 500 to 50,000 g / mol, more preferably 1,000 to 30,000 g / mol, most preferably 1,500 to 20,000 g / mol. 从500克/摩尔到50，000克/摩尔的所有单个数值和子范围都包含并公开在本文中。 From 500 g / mol to 50,000 g / All individual values ​​and subranges are included herein and disclosed mole herein. 在另一具体实施方案中，低分子量组分的密度大于或等于0. 960克/立方厘米。  In another embodiment, the density of the low molecular weight component is greater than or equal to 0.960 g / cc. 在另ー具体实施方案中，密度为0. 960至0. 987克/立方厘米，优选0. 962至0. 985克/立方厘米，更优选0. 965至0. 980克/立方厘米。ー In another particular embodiment, a density of 0.960 to 0.987 g / cc, preferably from 0.962 to 0.985 g / cc, and more preferably from .965 to .980 g / cc. 从0. 960到0. 987克/立方厘米的所有单个数值和子范围都包含并公开在本文中。 From 0.960 to .987 g / All individual values ​​and subranges cc are included herein and disclosed herein. 在另一具体实施方案中，低分子量组分具有大于或等于60%,优选大于或等于65%，更优选大于或等于70%的通过DSC测得的结晶度百分比。  In another embodiment, the low molecular weight component having greater than or equal to 60%, preferably greater than or equal to 65%, more preferably greater than or equal to percent crystallinity as measured by DSC by 70%. 优选地，这些聚合物具有60%至85%的结晶度百分比，且从60%到85%的所有单个数值和子范围都包含并公开在本文中。 Preferably, these polymers have a percent crystallinity of 60% to 85%, and from all the individual values ​​and subranges from 60 percent to 85 percent are included herein and disclosed herein. 低分子量こ烯聚合物组分是こ烯均聚物或こ烯基共聚体。  Low molecular weight alkylene polymer component is ko ko ko homopolymer or copolymer alkenyl. 合适的こ烯基共聚体包括含有一种或多种共聚単体的こ烯/ a -烯烃共聚体。 Ko Suitable alkenyl groups include interpolymers containing one or more copolymerizable ethylenically radiolabeling body ko / a - olefin interpolymer. 这类共聚体通常在最终聚合物中并入小于可聚合単体成分总重量的I重量％，优选小于0. 7重量％，更优选小于0. 5重量％的、共聚单体。 Such interpolymers typically incorporated in the final polymer may be less than the total weight of the polymerizable component I radiolabeling body wt%, preferably less than 0.7 wt%, more preferably less than 0.5 wt% comonomer. 从“大于0”到I重量％共聚单体的所有单个数值和子范围都包含并公开在本文中。 From "greater than 0" to I wt% All individual values ​​and subranges comonomer are included herein and disclosed herein. 低分子量组分优选具有每1，000个碳原子少于I个分支，更优选每5000个碳原子少于I个分支，再更优选每10，000个碳原子少于I个分支的支化频率。  Low molecular weight component preferably has less per 1,000 carbon atoms in the I branch, and more preferably per 5000 carbon atoms less than the I branch, and even more preferably less per 10,000 carbon atoms branches I the branching frequency. 在另一具体实施方案中，低分子量组分优选具有每1000个碳原子少于I个こ基或丁基分支，更优选每5，000个碳原子少于I个こ基或丁基分支，再更优选每10，000个碳原子少于I个こ基或丁基分支的支化频率。 In another particular embodiment, the low molecular weight component preferably has per 1000 carbon atoms less than the I ko branched or butyl, more preferably less per 5,000 carbon atoms in the I ko branched or butyl, even more preferably less per 10,000 carbon atoms in the I ko-yl or branched butyl branch frequency. 碳原子数包括位于骨架链段和分支中的碳原子。 Number of carbon atoms includes carbon atoms in the backbone segment and a branch. 2. 5，更优选大于或等于3. 0的分子量分布Mw/Mn。 2.5, more preferably greater than or equal to 3.0 molecular weight distribution Mw / Mn. 在另一具体实施方案中，低分子量组分具有小于或等于6. 0,优选小于或等于5. 5,更优选小于或等于5. 0的分子量分布Mw/Mn。 In another embodiment, the low molecular weight component having less than or equal to 6.0, preferably less than or equal to 5.5, more preferably less than or equal to 5.0 molecular weight distribution Mw / Mn. 低分子量组分可以具有来自两个或多个上述具体实施方案的性质的组合。  The low molecular weight component may have a combination of properties from two or more of the above-described specific embodiments. 低分子量组分的合适实例包括使用齐格勒-纳塔催化剂体系、铬基催化剂、单点催化剂，如受限几何催化剂或金属茂基催化剂，和后金属茂催化剂制成的气相树脂。  Suitable examples of low molecular weight components include using a Ziegler - Natta catalyst systems, chromium-based catalysts, single site catalysts, such as constrained geometry catalysts or metallocene-based catalysts, and gas-phase resin after the metallocene catalyst. 本发明的组合物含有至少ー种高分子量こ烯共聚体和至少ー种低分子量こ烯聚合物，各自如上所述。  The compositions of the present invention contains at least a high molecular weight species ー ko alkenyl interpolymer and at least ー ko low molecular weight olefin polymer, each as described above. 在ー个具体实施方案中，该组合物含有这些组分总重量的大于或等于50重量％的高分子量こ烯共聚体，并含有小于或等于50重量％的低分子量こ烯聚合物。 Molecular weight greater than or equal to 50 wt% in a particular embodiment ー embodiment, the composition contains a total weight of these components ko alkylene interpolymer, and comprising a low molecular weight olefin polymer is less than or equal to ko 50% by weight. 在另一具体实施方案中，该组合物具有优选2至20分克/分钟，更优选3至15分克/分钟，再更优选4至10分克/分钟，再更优选4至8分克/分钟，或4至7分克/分钟的高负荷熔体指数（I21)。  In another particular embodiment, the composition has preferably from 2 to 20 dg / min, more preferably from 3 to 15 dg / min, even more preferably from 4 to 10 dg / min, even more preferably from 4 to 8 dg / min, or 4 to 7 dg / min, a high load melt index (I21). 从2到20分克/分钟的所有单个数值和子范围都包含并公开在本文中。 From All individual values ​​and subranges from 2 to 20 dg / min are included herein and disclosed herein. 在另一具体实施方案中，该组合物具有大于或等于2，优选大于或等于3，更优选大于或等于4的高负荷熔体指数（I21)。  In another particular embodiment, the composition has greater than or equal to 2, preferably greater than or equal to 3, more preferably greater than or equal to the high load melt index (I21) 4 in. 在另一具体实施方案中，该组合物具有小于或等于10，优选小于或等于8，更优选小于或等于7的高负荷熔体指数（I21)。 In another particular embodiment, the composition has less than or equal to 10, preferably less than or equal to 8, and more preferably less than or equal to the high load melt index (I21) 7 in. 在另一具体实施方案中，该组合物具有优选0. 02至0. 2分克/分钟，更优选0. 03至0. I分克/分钟，再更优选0. 04至0. 08分克/分钟的熔体指数（I2)。  In another particular embodiment, the composition has preferably from 0.02 to 0.2 dg / min, more preferably 0.03 to 0. I dg / min, still more preferably from 0.04 to 0 08 dg / min melt index (I2). 从0. 02到0. 2分克/分钟的所有单个数值和子范围都包含并公开在本文中。 From individual values ​​and subranges from 0.02 to 0.2 dg / min are included herein and disclosed herein. 在另一具体实施方案中，该组合物具有优选0. 05至0. 2分克/分钟，更优选0. 06至0. I分克/分钟，再更优选0. 06至0. 08分克/分钟的熔体指数（I2)。  In another particular embodiment, the composition has preferably from 0.05 to 0.2 dg / min, more preferably 0.06 to 0. I dg / min, still more preferably from 0.06 to 0 08 dg / min melt index (I2). 从0. 05到0. 2分克/分钟所有单个数值和子范围都包含并公开在本文中。 From 0.05 to 0.2 dg / min All individual values ​​and subranges are included herein and disclosed herein. 在另一具体实施方案中，该组合物具有优选0. I至0. 5分克/分钟，更优选0. 15至0. 4分克/分钟，再更优选0. 2至0. 35分克/分钟，或0. 2至0. 3分克/分钟的熔体指数（I5)。  In another particular embodiment, the composition has preferably 0. I to 0.5 dg / min, more preferably from 0.15 to 0.4 dg / min, still more preferably from 0.2 to 0 35 dg / min, or from 0.2 to 0.3 dg / min melt index (I5). 从0. I到0. 5分克/分钟所有单个数值和子范围都包含并公开在本文中。 From 0. I to 0.5 dg / min All individual values ​​and subranges are included herein and disclosed herein. 在另一具体实施方案中，该组合物具有优选10至50，优选12至40，更优选15至35，再更优选17至30，最优选18至28的高熔体流动速率（121/15)。  In another particular embodiment, the composition has preferably 10 to 50, preferably 12 to 40, more preferably from 15 to 35, still more preferably 17 to 30, most preferably a high melt flow rate of 18 to 28 ( 121/15). 从10到50的所有单个数值和子范围都包含并公开在本文中。 From All individual values ​​and subranges from 10 to 50 are included herein and disclosed herein. 在另一具体实施方案中，该组合物具有优选5，000至100，000克/摩尔，更优选7，500至50，000克/摩尔，再更优选10，000至25，000克/摩尔的数均分子量。  In another particular embodiment, the composition has preferably from 5,000 to 100,000 g / mol, more preferably from 7,500 to 50,000 g / mol, still more preferably from 10,000 to 25,000 g / mole number average molecular weight. 从5000到100, 000克/摩尔的所有单个数值和子范围都包含并公开在本文中。 From 5000 to 100,000 g / All individual values ​​and subranges are included herein and disclosed mole herein. 在另一具体实施方案中，该组合物具有大于8，优选大于12，更优选大于16，再更优选大于18的分子量分布Mw/Mn。  In another particular embodiment, the composition has greater than 8, preferably greater than 12, more preferably greater than 16, even more preferably greater than 18, a molecular weight distribution Mw / Mn. 在另一具体实施方案中，该组合物具有大于或等于12，优选大于或等于15，更优选大于或等于18，再更优选大于或等于20的分子量分布Mw/Mn。 In another particular embodiment, the composition has greater than or equal to 12, preferably greater than or equal to 15, more preferably greater than or equal to 18, even more preferably greater than or equal to 20, a molecular weight distribution Mw / Mn. 在另ー具体实施方案中，该组合物具有小于或等于40，优选小于或等于35，更优选小于或等于30的分子量分布Mw/Mn。ー In another particular embodiment, the composition has less than or equal to 40, preferably less than or equal to 35, more preferably less than or equal to 30, a molecular weight distribution Mw / Mn. 从8到40的所有单个数值和子范围都包含并公开在本文中。 From All individual values ​​and subranges from 8 to 40 are included herein and disclosed herein. 在另一具体实施方案中，该组合物的密度优选为0. 950至0. 975克/立方厘米，更优选为0. 952至0. 972克/立方厘米，再更优选0. 955至0. 970克/立方厘米。  In another embodiment, the density of the composition is preferably from 0.950 to .975 g / cc, more preferably 0.952 to 0.972 grams / cubic centimeter, still more preferably 0. 955 to 0.970 g / cc. 在另一具体实施方案中，该组合物的密度大于0. 950克/立方厘米，优选大于或等于0. 955克/立方厘米。 In another embodiment, the density of the composition is greater than 0.950 g / cc, preferably greater than or equal to 0.955 g / cc. 在另一具体实施方案中，该组合物的密度小于或等于0. 975克/立方厘米，优选小于或等于0. 970克/立方厘米，更优选小于或等于0. 965克/立方厘米。 In another embodiment, the density of the composition is less than or equal to 0.975 g / cc, preferably less than or equal to 0.970 g / cc, more preferably less than or equal to 0.965 g / cc. 从0. 950克/立方厘米到0. 975克/立方厘米的所有单个数值和子范围都包含并公开在本文中。 From 0.950 g / cc to 0.975 g / All individual values ​​and subranges cc are included herein and disclosed herein. 在另一具体实施方案中，该组合物含有每1000个碳原子大于或等于0. I个こ烯基。  In another particular embodiment, the composition contains per 1000 carbon atoms is greater than or equal to 0. I ko one alkenyl group. 碳原子数包括骨架碳和支化碳。 Carbon atoms comprising a carbon backbone and carbon branching. 在另一具体实施方案中，该组合物具有大于15，优选大于18，更优选大于20的分子量分布Mw/Mn，且高分子量组分具有小于I. 0，优选小于0. 5分克/分钟的熔体指数121。  In another particular embodiment, the composition has greater than 15, preferably greater than 18, more preferably greater than 20, a molecular weight distribution Mw / Mn, and the high molecular weight component having less than I. 0, preferably less than 0.5 points g / min melt index of 121. 在另一具体实施方案中，该组合物具有大于15，优选大于18，更优选大于20的分子量分布Mw/Mn，且低分子量组分具有大于600，优选大于800分克/分钟的熔体指数12。  In another particular embodiment, the composition has greater than 15, preferably greater than 18, more preferably greater than 20, a molecular weight distribution Mw / Mn, the low molecular weight component and greater than 600, preferably greater than 800 dg / min 12 melt index. 在另一具体实施方案中，该组合物具有小于10分克/分钟,优选小于8分克/分钟的熔体指数121，且高分子量组分具有小于I. 0分克/分钟，优选小于0. 5分克/分钟的熔体指数I21。  In another particular embodiment, the composition has a melt index of less than 10 121 dg / min, preferably less than 8 dg / min, and the high molecular weight component having less than I. 0 dg / min, preferably less than 0.5 dg / min melt index I21. 在另一具体实施方案中，该组合物具有大于或等于15，优选大于或等于18，更优选大于或等于20的分子量分布（Mw/Mn)，且高分子量组分具有小于或等于6，优选小于或等于5. 5,更优选小于或等于5的分子量分布（Mw/Mn)。  In another particular embodiment, the composition has greater than or equal to 15, preferably greater than or equal to 18, more preferably greater than or equal to the molecular weight distribution (Mw / Mn) 20, and the high molecular weight component having less than or equal to 6, preferably less than or equal to 5.5, more preferably less than or equal to the molecular weight distribution (Mw / Mn) 5 a. 在另一具体实施方案中，该组合物具有大于或等于15，优选大于或等于18，更优选大于或等于20的分子量分布（Mw/Mn)，且低分子量组分具有小于或等于6，优选小于或等于5. 5,更优选小于或等于5的分子量分布（Mw/Mn)。  In another particular embodiment, the composition has greater than or equal to 15, preferably greater than or equal to 18, more preferably greater than or equal to the molecular weight distribution (Mw / Mn) 20, and the low molecular weight component having less than or equal 6, preferably less than or equal to 5.5, more preferably less than or equal to the molecular weight distribution (Mw / Mn) 5 a. 在另一具体实施方案中，该组合物具有大于或等于15，优选大于或等于18，更优选大于或等于20的分子量分布（Mw/Mn);高分子量组分具有小于或等于6，优选小于或等于5. 5，更优选小于或等于5的分子量分布（Mw/Mn);且低分子量组分具有小于或等于6，优选小于或等于5. 5,更优选小于或等于5的分子量分布（Mw/Mn)。  In another particular embodiment, the composition has greater than or equal to 15, preferably greater than or equal to 18, more preferably greater than or equal to the molecular weight distribution (Mw / Mn) 20; a component having a molecular weight of less than or equal to 6 , preferably less than or equal to 5.5, more preferably less than or equal to the molecular weight distribution (Mw / Mn) 5 a; and the low molecular weight component having 6 or less, preferably less than or equal to 5.5, more preferably less than or equal to 5 The molecular weight distribution (Mw / Mn). 该组合物可以具有来自两个或多个上述具体实施方案的性质的组合。  The composition may have a combination of properties from two or more of the above-described specific embodiments. 在另一具体实施方案中，该组合物不含分子量（Mw或Mn)比高分子量组分的分子、量（Mw或Mn)高的任何附加聚合组分。 Any additional polymerizable  In another particular embodiment, the composition is free of molecular weight (Mw or Mn) molecular weight component is high molecular, weight (Mw or Mn) of the high points. 在另一具体实施方案中，基于该组合物的总重量，高分子量组分和低分子量组分构成该组合物的大于或等于80重量％，优选构成该组合物的大于或等于90重量％,再更优选构成该组合物的大于或等于95重量％。 In another specific embodiment, based on the total weight of the composition, the high molecular weight component and the low molecular weight component constituting the composition is greater than or equal to 80 wt%, preferably constituting the composition is greater than or equal to 90% by weight, still more preferably composed of the composition is greater than or equal to 95 wt%. 在另一具体实施方案中，该组合物不含成核剂，如丁ニ酸钠、苯基こ酸铝、或芳族或脂环族羧酸的碱金属盐或铝盐。  In another particular embodiment, the composition is free of a nucleating agent, such as sodium butyrate Ni, alkali metal salts or aluminum salts of phenyl ko, aluminum, or an aromatic or alicyclic carboxylic acids. 可以按需要向本发明的组合物中加入添加剤。  Ji added may be added to the composition of the present invention as needed. 这些添加剂包括但不限于，抗氧化齐U、紫外线吸收剂、抗静电剂、顔料、染料、香料、填料、滑爽剂、阻燃剂、增塑剂、成核剂、加工助剂、润滑剤、稳定剂、烟尘抑制剂、粘度控制剂、交联剂、催化剂、增进剂、增粘剂和防粘连齐U。 These additives include, but are not limited to, antioxidant Qi U, ultraviolet absorbers, antistatic agents, pigments, dyes, perfumes, fillers, slip agents, fire retardants, plasticizers, nucleating agents, processing aids, lubricating Ji , stabilizers, smoke inhibitors, viscosity control agents, crosslinking agents, catalysts, boosters, tackifiers, and antiblocking Qi U. 该树脂组合物以及所需添加剂和/或要混入最终组合物中的任何其它树脂可以使用如掺合机和挤出机之类的设备和本领域中已知的和/或如下所述的其它设备混合在一起。 The resin composition and desired additives, and / or any other resin to be incorporated in the final composition may be used as the device and an extruder blender or the like and is known in the art and / or below the other equipment mixed together. 所用添加剂的选择和量取决于加工特性和最终产品的最终性质。 The choice and amount of additive used depends on the processing characteristics and final properties of the final product. 该组合物可以包含两种或更多本文所述的具体实施方案的组合。  The composition may comprise a combination of two or more specific embodiments of the embodiments described herein. 本发明的组合物可以通过多种方法制备。 The composition of  the present invention can be prepared by various methods. 例如，组合物可以通过在合适的混合设备，如掺合机或挤出机中掺合或混合高分子量こ烯共聚体和低分子量こ烯聚合物来制备。 For example, the composition may be prepared by blending or mixing the high molecular weight alkenyl ko ko interpolymer and a low molecular weight olefin polymer in a suitable mixing apparatus, such as a blender or extruder. 或者，这些组合物可以在单个反应器或多个聚合反应器中通过聚合反应制备。 Alternatively, these compositions can be prepared by polymerization reactor polymerization in a single reactor or more. ー些掺合法包括但不限于，借助挤出机、捏和机或类似装置掺合组分；在适当的溶剂（例如烃溶剂，如己烷、庚烷、癸烷、环己烷、苯、甲苯或ニ甲苯）或烃溶剂混合物中溶解组分，然后去除溶剤；独立地在适当的溶剂中溶解ー种或多种组分，将所得溶液合并，然后去除溶剂；和这些掺合法的任何组合。  ー these blending methods include, but are not limited to, by means of an extruder, kneader or the like blending component; in a suitable solvent (e.g. a hydrocarbon solvent such as hexane, heptane, decane, cyclohexane , benzene, toluene, or Ni) or a hydrocarbon solvent mixture of toluene soluble components and then removing the solvent Ji; independently dissolved ー or more components in a suitable solvent, and the resulting solutions were combined, then the solvent was removed; and the blending methods any combination thereof. 为了通过聚合制备组合物，聚合可以在ー个、或两个或多个阶段中，在不同反应条件下进行以制备各自组分。  In order to prepare a composition by polymerization, the polymerization may be carried out to prepare the respective components under different reaction conditions ー one, or two or more stages. 聚合物组分可以在分离出产物组合物之前混合。 The polymer components may be mixed prior to separation of the product composition. 如果聚合在一个反应中进行，可以使用两个或更多催化剂体系以形成各自组分。 If the polymerization is carried out in one reaction, two or more may be used to form the respective components of the catalyst system. 或者，该组合物可以在ー个或多个聚合反应器中原位制造。 Alternatively, the composition may be fabricated in-situ polymerization reactor in ー or more. 在ー个具体实施方案中，该组合物在双反应器构造中制造，其中在第一反应器中引入催化剂前体和助催化剂，并将聚合混合物转移到第二反应器中以进ー步聚合。  The composition is made in a dual reactor configuration in ー specific embodiments in which the introduction of the catalyst precursor and cocatalyst in the first reactor, and the polymerization mixture was transferred to a second reactor to feedー stage polymerization. 就催化剂体系而言，如果需要，仅从外部来源向第二反应器中添加助催化剂。 In terms of the catalyst system, if desired, only cocatalyst is added to the external source of the second reactor. 任选地，催化剂前体可以在添加到反应器中之前部分活化，然后进一歩在反应器中用助催化剂活化。 Optionally the catalyst precursor may be added to the partially activated prior to the reactor, then into a ho activating cocatalyst in a reactor. 在优选的双反应器构造中，在第一反应器中制备高分子量（低熔体流动指数）共聚体。  Preparation of high molecular weight in a first reactor in the preferred dual reactor configuration (low melt flow index) copolymer. 或者，可以在第一反应器中制备低分子量共聚物，并且可以在第二反应器中制备高分子量共聚物。 Alternatively, the low molecular weight copolymer can be prepared in the first reactor and the high molecular weight copolymer can be prepared in the second reactor. 对于本公开，其中的条件有助于制造高分子量聚合物的反应器被称作“高分子量反应器”。 For the present disclosure, wherein the conditions are conducive for producing the high molecular weight reactor polymer is referred to as "high molecular weight reactor." 或者，其中的条件有助于制造低分子量聚合物的反应器被称作“低分子量反应器”。 Alternatively, where the conditions are conducive for producing the low molecular weight reactor polymer is referred to as "low molecular weight reactor." 无论先制造哪种组分，优选经由互连装置使用氮气或第二反应器再循环气体作为转移介质将聚合物和活性催化剂的混合物从第一反应器转移到第二反应器。 No matter what components before manufacture, preferably via the interconnect device using nitrogen or second reactor recycle gas as a transfer medium the mixture of polymer and an active catalyst is transferred from the first reactor to the second reactor. 各反应器中的聚合优选使用连续流化床法在气相中进行。  The polymerization in each reactor is preferably conducted in a continuous gas phase fluidized bed process. 在典型的流化床反应器中，该床通常由反应器中要制造的相同粒状树脂构成。 In a typical fluidized bed reactor, the bed is usually of the same granular resin from the reactor configuration to be manufactured. 因此，在聚合过程中，该床包含成型的聚合物粒子、生长中的聚合物粒子、和通过聚合和通过改变以足以使粒子分离并充当流体的流速或速度引入的气态组分而流化的催化剂粒子。 Thus, during the polymerization, the bed comprises formed polymer particles, growing polymer particles, and by polymerization and by changing the particles to separate and act as a sufficient flow rate or velocity of the fluid introduced into the gaseous components and the flow of The catalyst particles. 流化气体由初始进料、补充进料、和循环（再循环）气体，即共聚単体，和如果需要，改性剂和/或惰性载气构成。 Fluidizing gas make-up feed from the initial feed, and cycle (recycle) gas, i.e., radiolabeling copolymer thereof, and, if desired, modifiers and / or an inert carrier gas is constituted. 典型的流化床系统包括反应器、床、气体分配板、入口和出口管、压缩机、循环气体冷却器和产物排出系统。  A typical fluid bed system includes a reactor, the bed, the gas distribution plate, inlet and outlet piping, a compressor, cycle gas cooler, and a product discharge system. 在该容器中，在床上方，存在减速区，并在床中存在反应区。 In the vessel, above the bed, there is a deceleration zone, and the presence of the reaction zone in the bed. 两者都在气体分配板上方。 Both the gas distribution plate. 典型的流化床反应器进一步描述在美国专利No. 4，482，687中，其整、个内容并入本文。 A typical fluidized bed reactor is further described in U.S. Patent No. 4,482,687, which is sharp, a incorporated herein. 在使用时，优选将こ烯、其它气态a -烯烃和氢的气态进料流以及液态a -烯烃和助催化剂溶液供入反应器再循环管。  In use, preferably alkenyl ko, other gaseous a - olefin and gaseous hydrogen and liquid feed stream a - olefins and the cocatalyst solution was fed to the reactor recirculation pipe. 任选地，可以将液态助催化剂直接供入流化床。 Optionally, the liquid cocatalyst can be fed directly into the fluidized bed. 优选将部分活化的催化剂前体作为矿物汕浆注入流化床。 Preferably the front portion of the activated catalyst precursor slurry into the fluidized bed as a mineral STU. 活化通常在反应器中通过助催化剂完成。 Activation is generally completed in the reactor via the cocatalyst. 可以通过改变引入流化床的単体的摩尔比来改变产物组成。 The product composition can be varied by changing the molar ratio of incorporated radiolabeling body of the fluidized bed. 在床的水平面随着聚合增高时，将产物以颗粒或微粒形式从反应器中连续排出。 With increasing polymerization, the product was discharged in granular or particulate form from the reactor continuously in the horizontal plane of the bed. 在两个反应器中均通过调节催化剂进料速率和/或こ烯分压来控制生产速率。 In the two reactors are by adjusting the catalyst feed rate and / or controlling the partial pressure of alkylene ko production rate. 优选模式是从第一反应器中提取批量产物，并利用由再循环气体压缩系统产生的压差将这些转移到第二反应器中。  Preferably the pattern is extracted from the first product of a batch reactor, and using the pressure generated by the recycle gas compression system will be transferred to the second reactor. 与美国专利No. 4，621，952 (其整个内容并入本文）中所述类似的系统特别有用。 Particularly useful and U.S. Patent No. 4,621,952 (the entire contents of which are incorporated herein) in a similar system. 在第一和第二反应器中，压カ大致相同。  In the first and second reactor, the pressure is substantially the same ka. 根据用于将聚合物和所含催化剂的混合物从第一反应器转移到第二反应器的具体方法，第二反应器压力可以高于或略低于第一反应器。 According to the mixture of polymer and contained catalyst from the first reactor is transferred to a specific method of the second reactor, the second reactor pressure may be higher or slightly lower than the first reactor. 如果第二反应器压力略低，可利用这种压差促进聚合物催化剂混合物从反应器I转移到反应器2。 If the second reactor pressure is slightly lower, this pressure differential can be utilized to promote the polymer catalyst mixture from the reactor transferred to the reactor I 2. 如果第二反应器压カ较高，可以利用循环气体压缩机两侧的压差作为移动聚合物的原动力。 If the second reactor pressure is higher grades, may utilize the pressure differential across the cycle gas compressor as the motive force of the moving polymer. 压力，即任一反应器中的总压力，可以为200至500psig(磅/平方英寸规格），并优选为280至450psig。 Pressure, i.e., any of a total pressure in the reactor may be from 200 to 500 psig (pounds / square inch gauge), and preferably 280 to 450 psig. 第一反应器中的こ烯分压可以为10至150psig,并优选为20至SOpsig，更优选为25至60psig。 Ko alkenyl dividing the first reactor may be 10 to 150psig, and preferably 20 to SOpsig, more preferably from 25 to 60psig. 根据为实现上述分流而需要在此反应器中生成的共聚物的量，设定第二反应器中的こ烯分压。 To achieve the above the amount required to generate this shunt reactor copolymer, dividing the second set ko alkenyl reactor. 要指出的是，提高第一反应器中的こ烯分压导致第二反应器中的こ烯分压提高。 It is noted that improved ko alkenyl first reactor leads to the partial pressure of the second reactor ko alkenyl partial pressure increase. 通过こ烯以外的a-烯烃和惰性气体（如氮气）提供总压力的平衡。 The total pressure is provided by a- olefin and an inert gas (e.g., nitrogen) other than the alkenyl ko balance. 其它惰性烃，如诱发的冷凝剂，例如异戊烷、己烧，也根据其在反应器中经受的温度和压カ下的蒸气压而构成反应器中总压カ的一部分。 Other inert hydrocarbons, such as induced condensing agents, such as isopentane, hexane burning, also form part of the total pressure in the reactor according to their grades in the reactor is subjected to temperature and pressure at the vapor pressure grades. 可以调节氢：こ烯摩尔比以控制平均分子量。  The hydrogen can be: mole ratio ko to control average molecular weights. a-烯烃（非こ烯）可以以共聚物的最多15重量％的总量存在，且如果使用，优选以共聚物重量的0. 5至10重量％或更优选0. 8至4重量％的总量包含在共聚物中。 a- olefin (non ko en) amount may be up to 15% by weight of the copolymer is present, and, if used, is preferably from 0.5 to 10 wt% of the weight of the copolymer or, more preferably 0.8 to 4% by weight amount contained in the copolymer. 包括气态和液态反应物、催化剂和树脂的反应物混合物在各流化床中的停留时间可以为I至12小时，并优选为I. 5至5小时。  including gaseous and liquid reactants, catalyst and reaction mixture residence time of the resin in each fluidized bed can be 12 hours I, and preferably is I. 5 to 5 hours. 如果需要，反应器可以以冷凝模式运行。  If desired, the reactor can be operated in condensing mode. 冷凝模式描述在美国专利Nos. 4，543，399 ;4，588，790 ;和5，352，749中，它们的整个内容并入本文。 Condensing mode is described in U.S. Patent No. 4,543,399 Nos; 4,588,790; and 5,352,749, the entire contents of which are incorporated herein. 可用于制备该共混物的典型过渡金属催化剂体系是以美国专利No. 4，302，565中所述的催化剂体系为例的镁/钛基催化剂体系；如美国专利Nos. 4，508，842,5, 332，793、5，342，907、和5，410, 003中所述的那些钒基催化剂体系；如美国专利No. 4，101, 445中所述的铬基催化剂体系；和如美国专利Nos. 4，937，299,5, 317，036和5，527，752中所述的单点催化剂体系。 Typical transition metal catalyst system  can be used in the blend is prepared in U.S. Patent No. 4,302,565 as an example of the catalyst system is a magnesium / titanium based catalyst system; as U.S. Patent Nos 4, 508,842,5, 332,793,5,342,907, and 5,410, 003 as those in the vanadium based catalyst system; U.S. Pat. No. chromium-based catalyst systems of the 4,101, 445 ;., and U.S. Patent Nos 4,937,299,5, 317,036 and 5,527,752 single site catalyst system said. 这些专利各自完全经此引用并入本文。 Each of these patents are fully incorporated herein by reference. 使用在ニ氧化硅-氧化铝载体上的铬或钥氧化物的催化剂体系也可用。 Using silica ni - catalyst system, or chromium oxide on alumina key vectors are also available. 用于制备本发明的共混物的组分的优选催化剂体系是齐格勒-纳塔催化剂体系和单点催化剂体系。 Preferred catalyst systems for preparing the components of the blend of the present invention is a Ziegler - Natta catalyst systems and single site catalyst systems. 在ー些具体实施方案中，该方法中用于制造本发明的组合物的优选催化剂是镁、/钛类型的。  In some particular embodiments ー embodiment, the process for producing the catalyst of the present invention is preferably a composition is magnesium / titanium type. 特别地，对于本气相聚合，催化剂由在给电子溶剂中的包含镁和钛氯化物的前体制成。 In particular, for the present gas phase polymerizations, the catalyst consisting of a precursor comprising magnesium and titanium chlorides in an electron into the solvent. 该溶液通常沉积在多孔催化剂载体上，或加入填料，其在随后的喷雾干燥后为粒子提供额外机械强度。 The solution is typically deposited on a porous catalyst support, or a filler is added, which provides additional mechanical strength to the particles after spray drying followed. 来自任ー载体法的固体粒子通常在稀释剂中制浆，这产生高粘混合物，其随后用作催化剂前体。 The solid particles from either support methods generally ー slurried in a diluent, which produces a highly viscous mixture, which is then used as catalyst precursor. 示例性催化剂类型描述在美国专利Nos. 6，187，866和5，290，745中，两者的整个内容均并入本文。 Exemplary catalyst types are described in U.S. Patent Nos. 6,187,866 and 5,290,745, the entire contents of both of which are incorporated herein. 也可以使用沉淀/結晶的催化剂体系，如美国专利Nos. 6，511，935和6，248，831中所述的那些，两者的整个内容均并入本文。 Use may also be precipitated / crystallized catalyst systems, such as U.S. Patent Nos. 6,511,935 and those, the entire contents of both are described in 6,248,831 incorporated herein by reference. 本文所用的术语“催化剂前体”是指包含钛和镁化合物和路易斯碱给电子体的混合物。  As used herein, the term "catalyst precursor" means a mixture comprising titanium and magnesium compounds and a Lewis base electron donor. 优选地，该催化剂前体具有式MgdTi (OR)eXf (ED)g，其中R是具有I至14个碳原子的脂族或芳族烃基团或C0R'，其中R'是具有I至14个碳原子的脂族或芳族烃基团；各OR基团相同或不同；X独立地为氯、溴或碘；ED是给电子体；d是0.5至56 $是0、1或2ば是2至116 ;且g是>2且最多为I. 5*d+3。 Preferably, the catalyst precursor has the formula MgdTi (OR) eXf (ED) g, wherein R is an I-aliphatic or aromatic hydrocarbon radical or C0r 14 carbon atoms ', wherein R' is an I-14 aliphatic or aromatic hydrocarbon radical carbon atoms; the same or different from each oR group; X-is independently chlorine, bromine or iodine; ED is an electron donor; D is from 0.5 to 56 $ 2 0, 1 or 2 ba to 116; and g is> 2 and up to I. 5 * d + 3. 其由钛化合物、镁化合物和给电子体制成。 Thereof, a magnesium compound and a titanium compound into the electron system. 给电子体是在0°C至200°C下为液体的有机路易斯碱，镁和钛化合物可溶于其中。  The electron donor is at 0 ° C to 200 ° C is an organic liquid Lewis base, magnesium and titanium compounds are soluble. 给电子体化合物有时也被称作路易斯碱。 The electron donor compounds are sometimes also referred to as Lewis bases. 给电子体可以是脂族或芳族羧酸的烷基酯、脂族酮、脂族胺、脂族醇、烷基或环烷基醚、或其混合物，各给电子体具有2至20个碳原子。 The electron donor can be an alkyl ester of an aliphatic or aromatic carboxylic acids, aliphatic ketones, aliphatic amines, aliphatic alcohols, alkyl or cycloalkyl ether, or mixtures thereof, each electron donor having 2 to 20 carbon atom. 在这些给电子体中，优选的是具有2至20个碳原子的烷基和环烷基醚；具有3至20个碳原子的ニ烷基、ニ芳基和烷基芳基酮；和具有2至20个碳原子的烷基、烷氧基和烷基和芳基羧酸的烷基烷氧基酷。 Among these electron donors, preferably having from 2 to 20 carbon atoms and cycloalkyl ethers; ni alkyl group having 3 to 20 carbon atoms, ni aryl and alkyl aryl ketones; having alkyl group of 2 to 20 carbon atoms, alkoxy and alkyl and aryl carboxylates of alkyl alkoxy cool. 最优选的给电子体是四氢呋喃。 The most preferred electron donor is tetrahydrofuran. 合适的给电子体的其它实例是甲酸甲酷、こ酸こ酷、こ酸丁酷、こ基醚、ニ氧杂环己烷、ニ正丙基醚、ニ丁基醚、こ醇、I- 丁醇、甲酸こ酷、こ酸甲酷、茴香酸こ酷、碳酸亚こ酷、四氢吡喃和丙酸こ酷。 Other examples of suitable electron donors are methyl formate cool, cool ko ko acid, butyric acid ko cool, ko ether, trioxane ni, ni n-propyl ether, butyl ether ni, ko alcohol, I- butanol, formic acid ko cool, cool A ko acid, anisic acid ko cool, cool ko ethylene carbonate, tetrahydropyran, and propionic acid ko cool. 尽管ー开始可以使用大量过量的给电子体提供钛化合物和给电子体的反应产物，但最终催化剂前体含有每摩尔钛化合物I至20摩尔给电子体，优选每摩尔钛化合物I至10摩尔给电子体。  Although ー started using a number of the titanium compound and the reaction product of an excess of electron donor is supplied to the electron donor, the final catalyst precursor containing per mole of titanium compound I to 20 moles for each mole of the titanium compound electron donor, preferably I to 10 moles of electron donor. 由于催化剂将充当聚合物生长的模板，催化剂前体必须转化成固体。  Since the catalyst will act as a template the growth of the polymer, the catalyst precursor be converted into a solid. 所得固体还必须具有适当的粒度和形状以产生具有相对较窄的粒度分布、低细粒量和良好流化特性的聚合物粒子。 The resulting solid must also have an appropriate size and shape to produce a relatively narrow particle size distribution, polymer particles of the low amount of fines and good flow properties. 尽管路易斯碱、镁和钛化合物的这种溶液可以浸溃到多孔载体中并干燥形成固体催化剂，但溶液优选经由喷雾干燥转化成固体催化剂。 Although this solution of Lewis base, magnesium and titanium compounds may be impregnated into a porous support and dried to form a solid catalyst, but preferably by spray-drying solution is converted into a solid catalyst. 这些方法各自形成“负载型催化剂前体”。 Each of these methods to form a "front loading type catalyst precursor." 合适的喷雾干燥催化剂体系描述在国际公开NO.W02006/023057中，其完全经此引用并入本文。 Suitable spray-dried catalyst systems are described in International Publication NO.W02006 / 023057, which is incorporated fully herein by reference. 随后优选将喷雾干燥的催化剂产物加入矿物油浆。  then preferably spray dried catalyst product is added a mineral oil slurry. 烃浆料稀释剂的粘度足够低以使该浆料可以方便地泵送通过预活化装置并最终进入聚合反应器。 Viscosity of the hydrocarbon slurry diluent is sufficiently low so that the slurry can be conveniently pumped through the pre-activation apparatus and eventually into the polymerization reactor. 使用浆料催化剂进料器将催化剂送入。 Using a slurry catalyst feeder into the catalyst. 通常在商业反应系统中使用螺杆泵，如Moyno泵，同时通常在试验级反应系统中使用双活塞注射泵，其中催化剂流速< 10立方厘米/小时浆料。 Typically used in commercial reaction systems screw pump, such as Moyno pumps, while a dual piston syringe pump is typically used in pilot-scale reactor system wherein the catalyst flow rate <10 cc / hr slurry. 也将助催化剂或活化剂送入反应器以实现聚合。  Also the cocatalyst or activator is fed to the reactor to effect the polymerization. 在附加助催化剂作用下的完全活化要求达到完全活性。 Fully activated in the additional cocatalyst is required to achieve full activity effect. 完全活化通常在聚合反应器中进行，尽管也可以使用EP1200483中教导的技术。 Complete activation is generally carried out in the polymerization reactor, may be used although the techniques taught in EP1200483. 传统上使用的助催化剂（其是还原剂）由铝化合物构成，但锂、钠和钾的化合物、碱土金属以及铝以外的其它碱土金属的化合物也可行。  cocatalysts conventionally used (which is a reducing agent) is made of aluminum compounds, but compounds other than the alkaline earth metal compound of lithium, sodium and potassium, alkaline earth metals, and aluminum is also possible. 这些化合物通常是氢化物、有机金属或卤化物。 These compounds are usually hydrides, organometal or halide. 丁基锂和ニ丁基镁是铝以外的可用化合物的实例。 Ni-butyllithium and dibutyl magnesium are examples of useful compounds of other than aluminum. 通常与任何钛基催化剂前体一起使用的活化剂化合物可以具有式AlRaXbH。  activator compounds are generally used with any of the titanium based catalyst precursor may have the formula AlRaXbH. ，其中各X独立地为氯、溴、碘，或0R' ；各R和R'独立地为具有I至14个碳原子的饱和脂族烃基、团；b是0至I. 5 ;c是0或I ;且a+b+c = 3。 Wherein each X is independently chlorine, bromine, iodine, or 0R '; each R and R' are independently a saturated aliphatic hydrocarbon group having I to 14 carbon atoms, groups; B is 0 to I. 5; c is 0 or I; and a + b + c = 3. 优选的活化剂包括烷基铝单-和ニ氯化物，其中各烷基具有I至6个碳原子，和三烷基铝。 Preferred activators include alkylaluminum mono - and Ni chlorides wherein each alkyl has I to 6 carbon atoms, and the trialkylaluminums. 实例是氯化ニこ基铝和三正己基铝。 Examples are aluminum chloride and tri-n ni ko-yl-hexyl aluminum. 每摩尔给电子体使用大约0. 10至大约10摩尔，优选0. 15至2. 5摩尔的活化剂。 Used per mole of electron donor from about 0.10 to about 10 moles, preferably from 0.15 to 2.5 mole of activator. 活化剂与钛的摩尔比为1:1至10 :1，并优选为2:1至5:1。 The molar ratio of activator to titanium is 1: 1 to 10: 1, and preferably from 2: 1 to 5: 1. 烃基铝助催化剂可以如式R3Al或R2AlX所示，其中各R独立地为烷基、环烷基、芳基或氢；至少ー个R是烃基；且两个或三个R基团可以连接形成杂环结构。  The hydrocarbyl aluminum cocatalyst can be shown in the formula R3Al or R2AlX, wherein each R is independently an alkyl group, a cycloalkyl group, an aryl group, or hydrogen; ー least one R is hydrocarbyl; and two or three R groups You may join to form a heterocyclic structure. 作为烃基的各R可以具有I至20个碳原子，并优选具有I至10个碳原子。 As each hydrocarbon group R may have I to 20 carbon atoms, and preferably having I to 10 carbon atoms. X是卤素，优选为氯、溴或碘。 X is halogen, preferably chlorine, bromine or iodine. 烃基招化合物的实例如下：ニ异丁基招、ニ正己基招、_■异丁基招氣化物、_■己基招氣化物、_■异丁基己基招、异丁基_■己基招、ニ甲基招、ニこ基招、ニ丙基招、ニ异丙基招、ニ正丁基招、三辛基铝、三癸基铝、三-十二烷基铝、三苄基铝、三苯基铝、三萘基铝、三甲苯基铝、ニ丁基铝氯化物、ニこ基铝氯化物、和三氯化ニこ基铝氯化物。 Examples of hydrocarbyl strokes compounds are as follows: ni isobutyl strokes, ni n-hexyl strokes, _ ■ isobutyl strokes vapor, _ ■ hexyl strokes vapor, _ ■ isobutyl hexyl strokes, isobutyl _ ■ hexyl strokes, methyl move ni, ni ko group strokes, strokes ni propyl, isopropyl move ni, ni n-butyl strokes, trioctyl aluminum, tridecyl aluminum, tri - dodecyl aluminum, tribenzyl aluminum, triphenyl aluminum, tri aluminum naphthyl, mesityl aluminum, tributyl aluminum chloride ni, ni ko group aluminum chloride, and aluminum trichloride ni ko chloride group. 助催化剂化合物也可以充当活化剂和改性剂。 Cocatalyst compounds can also serve as activators and modifiers. 活化剂可以在聚合之前和/或之中添加到前体中。  activators may and / or in adding to the precursor before the polymerization. 在一个程序中，前体在聚合之前完全活化。 In one procedure, the precursor is fully activated before polymerization. 在另ー程序中，前体在聚合之前部分活化，且活化在反应器中完成。ー procedure, the precursor is partially activated before polymerization in the other, and the activation is completed in the reactor. 在使用改性剂代替活化剂吋，改性剂通常溶解在有机溶剂，如异戊烷中，并在使用载体时，在钛化合物或络合物浸溃后浸溃到载体中，此后将负载的催化剂前体干燥。 Instead of using an activator inch modifiers, modifier is usually dissolved in an organic solvent, such as isopentane, and a carrier is used, the titanium compound or complex, after impregnated impregnated into the carrier, after which the load catalyst precursor is dried. 或者，将改性剂溶液独立地直接添加到反应器中。 Alternatively, independent modifier solution is added directly to the reactor. 改性剂在化学结构和功能上类似于作为助催化剂的活化剂。 Modifying agent in chemical structure and function similar as the activator cocatalyst. 对于变体，參见例如美国专利No. 5，106，926，其完全经此引用并入本文。 For variations, see, e.g. U.S. Pat. No. 5,106,926, which is incorporated fully herein by reference. 助催化剂优选在启动こ烯流的同时单独不掺杂地或作为在惰性溶剂（如异戊烷）中的溶液添加到聚合反应器中。 Preferably undoped cocatalyst separately at the same time start ko alkenyl stream or as an inert solvent (such as isopentane) was added to the polymerization reactor. 在使用载体的那些具体实施方案中，前体负载在无机氧化物载体，如ニ氧化硅、磷酸铝、氧化铝、ニ氧化硅/氧化铝混合物、已经用有机铝化合物如三こ基铝改性的ニ氧化硅、和用ニこ基锌改性的ニ氧化硅上。  In particular embodiments, those using a carrier precursor supported on an inorganic oxide support, such as Ni silica, aluminum phosphate, alumina, silica Ni / alumina mixture, an organoaluminum compound have been used such as tris ko-yl ni aluminum-modified silica, and zinc-based modified with the silicon oxide ni ni ko. 在ー些具体实施方案中，ニ氧化硅是优选载体。 In some particular embodiments ー embodiment, Ni is preferably silica support. 典型的载体是对聚合基本惰性的固态微粒状多孔材料。 A typical support is a porous solid particulate material substantially inert to the polymerization. 其以平均粒度为10至250微米且优选30至100微米；表面积为至少200平米/克且优选至少大约250平米/克；且孔径大小为至少大约100埃且优选至少大约200埃的干粉形式使用。 Which is an average particle size of 10 to 250 microns and preferably 30 to 100 micrometers; a surface area of ​​at least 200 square meters / gram and preferably at least about 250 square meters / g; and a pore size of at least about 100 angstroms and preferably at least a dry powder form of about 200 angstroms using . 通常，所用载体的量提供每克载体0. I至I. 0毫摩尔钛，优选每克载体0. 4至0. 9毫摩尔钛。 Typically, the provided I. 0 to I millimole of titanium, per gram of support is preferably 0.4 to 0.9 millimole of titanium per gram of support with a quantity of carrier 0.5. 可以通过将前体和硅胶在给电子体溶剂或其它溶剂中混合然后减压去除溶剂来使上述催化剂前体浸入ニ氧化硅载体。 Can be prepared by mixing the precursor and silica gel in the electron donor solvent or other solvent is then removed under reduced pressure and solvent so that the catalyst precursor is immersed ni silica carrier. 当不需要载体时，该催化剂前体可以以液体形式使用。 When no carrier, the catalyst precursor can be used in liquid form. 尽管本发明的聚こ烯共混物优选通过各种低压法在气相中制造。  Poly-ene ko blend preferably Although the present invention is manufactured in the gas phase by various low pressure process. 该共混物也可以通过传统技术，仍然在低压下在溶液或淤浆液相中制造。 The blend can also be by conventional techniques, it is still at low pressure producing in solution phase or slurries. 低压法通常在低于IOOOpsi的压カ下运行，而高压法通常在高于15，OOOpsi的压カ下运行。 Low pressure processes are typically run at a pressure below IOOOpsi ka, while high pressure processes generally higher than 15, the operation of the pressure OOOpsi ka. 本发明的组合物可以在单一反应器中使用混合催化剂制备。  The compositions of the present invention can be prepared using a mixed catalyst in a single reactor. 在这类混合催化剂体系中，催化剂组合物可以包括两种或多种齐格勒-纳塔催化剂、两种或多种金属茂基催化剂的组合，如美国专利Nos. 4，937，299 ;5，317，036 ;和5，527，752 (各自的整个内容完全经此引用并入本文）中所述的那些，或齐格勒-纳塔和金属茂催化剂的组合。 In such mixed catalyst systems, the catalyst composition may comprise two or more Ziegler - Natta catalyst, a combination of two or more metallocene-based catalysts, as described in US Patent Nos 4,937,299;. 5, 317,036; - Natta and metallocene catalysts and 5,527,752, or those described in Ziegler (the entire contents of each of which is incorporated fully herein by reference). 在ー些具体实施方案中，可以使用双点或多点金属茂催化剂。ー In some embodiments, double or multiple point may be a metallocene catalyst. 本发明的组合物的应用  application of the composition of the present invention. 、 本发明的组合物具有优异的可模塑性，并可以通过各种模制（或成型）法，例如吹塑、真空或压カ成型、吹胀模塑、挤压模塑和膨胀模塑法模制成各种制品（例如エ业化学品的罐子、桶、瓶子、槽、吹胀薄膜和管道）。 ,  The compositions of the present invention has excellent moldability, and can be manufactured by various molding (or forming) methods such as blow molding, vacuum or pressure molding grades, blow molding, extrusion molding, and expansion molding into various molded articles (e.g. Ester industrial chemicals cans, barrels, bottles, tanks, inflation films and pipes). 由此制成的模制品，如エ业化学品的罐子、桶、槽和瓶子具有优异的机械强度以及刚度。 Molded articles made therefrom, such as industrial chemicals Ester cans, barrels, and bottles grooves having excellent mechanical strength and rigidity. 本发明的组合物特别可用于吹塑操作，但是，它们也可用在各种注射成型法、旋转模塑法、热成型法、注射吹塑法、注射拉伸吹塑法、压缩吹塑成型法、挤出发泡法和各种成膜法中。  The compositions of the present invention are particularly useful for blow molding operations, however, they can also be used in various injection molding, rotational molding, thermoforming, injection blow molding, injection stretch blow molding, compression blow molding method, extrusion foaming, and various film-forming method. 因此，通过所有这些方法制成的制品可以由本发明的组合物形成。 Accordingly, the present invention is formed from a composition of all articles made by these methods. 特别地，一些本发明的制品包括55加仑桶、汽车油箱和储槽。 In particular, some articles of the invention comprises a 55 gallon drum, automotive fuel tanks and reservoirs. 其它制成品包括片材、单带、单丝、泡沫、纤维和薄膜。  Other manufacture comprising a sheet, a single tape, monofilament, foams, fibers and films. 薄膜可以是单层或多层薄膜。 The film may be monolayer or multilayer films. 薄膜可以与其它层共挤出或薄膜可以层压到另ー层或多层上。 Film may be coextruded with other layers or films may be laminated to another layer or multilayer ー. 如果薄膜是两层或更多层的共挤出物，该薄膜仍然可以根据最終薄膜的其它物理要求层压到包装材料的附加层上。 If the film is a co-extrusion of two or more layers, the film may still be based on other physical requirements of the final film is laminated onto the additional layer of the packaging material. 单层和共挤出薄膜也可以经过其它后挤出技术，例如双轴取向法。 Monolayer and coextruded films can also go through other post extrusion techniques, e.g. biaxial orientation method. 挤出涂布是使用本文所述的新型组合物制造多层薄膜结构用的另ー技木。  Extrusion coating is used the novel compositions described herein for producing multilayer film structures ー another technology of wood. 该新型组合物构成该薄膜结构的至少ー层。 The novel composition of the film structure constituting at least ー layer. 类似于浇注薄膜，挤出涂布是平模技木。 Similar to cast film, extrusion coating is a flat die technique wood. 可以将密封剂以单层或共挤出物形式挤出涂布到基底上。 Sealant extrusion coating may be a single layer or co-extruded onto the substrate in the form. 本发明提供了包含至少ー个由木发明的组合物形成的部件的制品。  The present invention provides an article of a composition comprising a member ー invention is formed from wood of at least. 在优选具体实施方案中，该制品是挤出吹塑制品。 In a preferred embodiment, the article is an extrusion blow molded article. 如果任何下限值和任何上限值之间相差至少两个単位，本文所列的任何数值范围包括从该下限值到该上限值的以I単位为增量的所有数值。  If the difference between any lower value and any higher value. Unit least two, any numerical range recited herein includes from the lower to the upper limit value in increments. Unit I, all numerical values ​​of the upper limit. 例如，如果指出一种组成性质、物理性质或其它性质，例如分子量、熔体指数等为100至1000，在本说明书中意在明确列举所有单个数值，例如100、101、102等和子范围，例如100至144、155至170、197至200等。 For example, if one composition noted properties, physical properties or other properties, such as molecular weight, melt index, etc., is from 100 to 1000, in Italian expressly enumerated in this specification all individual values, such as 102, etc., and sub ranges, such as 100 to 144, 155 to 170, 197 to 200 and so on. 对于含有小于I的数值或含有大于I的分数（例如I. I、I. 5等）的范围，如果适当，ー个单位被认为是0. 0001,0. 001,0. 01或0. I。 For I containing less than the numerical value or range containing more than I score (e.g. I. I, I. 5, etc.) and, if appropriate, one unit is considered ー 0. 0001,0. 001,0. 01 or 0. I . 对于含有小于10的单数位数值的范围（例如I至5)，一个单位通常被认为是0. I。 For single digit numerical range containing less than 10 (e.g., I to 5), one unit is typically considered to be 0. I. 这些仅是具体意图的实例，且所列举的最下限值和最上限值之间的数值的所有可能的组合都被认为在本申请中明确指明。 These are only examples of what is specifically intended, and most recited lower limit and the combinations of all possible values ​​between the uppermost limit are to be considered explicitly indicated in the present application. 如本文所述，已经列举了关于熔体指数、重均分子量、数均分子量、分子量分布（Mw/Mn)、结晶度百分比、共聚单体百分体、共聚单体中的碳原子数和其它性质的数值范围。 As described herein, have been listed on the melt index, weight average molecular weight, number-average molecular weight, molecular weight distribution (Mw / Mn), percent crystallinity, percent comonomer body, the number of carbon atoms and other copolymerizable monomers value range of properties. 本文所用的术语“组合物”包括构成该组合物的材料的混合物，以及由该组合物的材料形成的反应产物和分解产物。  As used herein, the term "composition" comprises a material of the composition of the mixture, as well as reaction products and decomposition products formed from the materials of the composition. 本文所用的术语“聚合物”是指通过使单体（无论是相同还是不同类型）聚合而制成的聚合化合物。  As used herein, the term "polymer" refers to a polymeric compound prepared by polymerizing a monomer (whether of the same or a different type) polymerization. 通用术语聚合物因此包括通常用于表示仅由ー种类型的单体制成的聚合物的术语均聚物，和如下定义的术语共聚体。 The generic term polymer thus embraces the term commonly used to refer to a polymer made of the types of monomers ー only a homopolymer, and the term interpolymer as defined below. 本文所用的术语“共聚体”是指通过至少两种不同类型的単体的聚合制成的聚合物。  As used herein, the term "interpolymer" means a polymer by polymerization radiolabeling at least two different types of body made. 通用术语共聚体因此包括通常用于表示由两种不同类型的单体制成的聚合物的共聚物，和由两种以上不同类型的单体制成的聚合物。 The generic term interpolymer thus includes copolymers commonly used to refer to a polymer from two different types of monomers formed, and polymers prepared from two or more different types of monomers made. 本文所用的术语“こ烯聚合物”是指主要（大于50摩尔％ )由こ烯单体単元形成的聚合物。  As used herein, the term "ko olefin polymer" means a polymer formed from the main olefin monomers radiolabeling ko membered (more than 50 mol%). 摩尔百分比基于可聚合単体的总摩尔数。 Mole percent based on the total of polymerizable material number of moles of radiolabeling. こ烯共聚体也主要（大于50摩尔％)含有こ烯单体単元。 Ko alkylene interpolymer is mainly (more than 50 mole%) monomers containing an ethylenically ko radiolabeling element. 、 本文所用的术语“共混物”或“聚合物共混物”是指两种或多种聚合物的共混物。 ,  As used herein, the term "blend" or "polymer blend" means a blend of two or more polymers. 这类共混物可以可混溶或不可混溶。 Such a blend may be miscible or immiscible. 这类共混物可以相分离或不相分离。 Such a blend may or may not phase separation phase separation. 这类共混物可以含有或不含ー种或多种由透射电子能谱法、光散射法、X-射线散射法和本领域已知的其它方法测得的畴构造。 Such a blend may or may not contain one or more ー from transmission electron spectroscopy, light scattering, X- ray scattering method and domain configurations, other methods known in the art measured. 术语“基本均匀的共聚单体分布”在本文中是指，在聚合物组分的分子量范围内，聚合物部分的共聚单体含量相差小于10重量％ ,优选小于8重量％ ,更优选小于5重量最优选小于2重量％。  The term "substantially uniform comonomer distribution" used herein refers to the molecular weight range of the polymer component, comonomer content of the polymer portion by less than 10% by weight, preferably less than 8% by weight, and more preferably less than 5 wt% and most preferably less than 2 wt. 术语“反向共聚单体分布”在本文中是指，在聚合物组分的分子量范围内，各种聚合物部分的共聚单体含量不基本均匀，且其较高的分子量部分具有按比例更高的共聚单体含量。  The term "reverse comonomer distribution" used herein refers to the molecular weight range of the polymer component, comonomer content of various polymer fractions are not substantially uniform and the higher molecular weight portion thereof having at a higher percentage of comonomer content. 基本均匀的共聚单体分布和反向共聚单体分布均可使用分级技术，例如凝胶渗透色谱法-差示粘度測定（GPC-DV)、升温洗脱分馏-差示粘度測定（TREF-DV)和交叉分级技术測定。 A substantially uniform comonomer distribution and a reverse comonomer distribution can be used fractionation techniques, such as gel permeation chromatography - differential viscometry (GPC-DV), temperature rising elution fractionation - differential viscometry (TREF-DV ) and cross-fractionation techniques was measured. 共聚单体分布也可以通过GPC-FTIR技术測定。 Determination comonomer distribution may be by GPC-FTIR. 术语“均匀的”和“均匀支化的”用于表示こ烯/ a -烯烃聚合物（或共聚体），其中共聚单体无规分布在给定聚合物分子中，且基本所有聚合物分子都具有相同的こ烯-共聚单体比率。  The term "homogeneous" and "homogeneously branched" is used to ko-ene / a - olefin polymer (or interpolymer), in which the comonomer is randomly distributed within a given polymer molecule, and substantially all polymer molecules have the same ethylenically ko - comonomer ratio. 均匀支化的こ烯共聚体包括线型こ烯共聚体和基本线型こ烯共聚体。 Homogeneously branched alkenyl ko ko interpolymers include linear and substantially linear interpolymers alkenyl ko alkylene interpolymer. 均匀支化的线型こ烯共聚体中包括缺乏长链支化但具有来自聚合到共聚体中的共聚单体并均匀分布在相同聚合物链内和不同聚合物链之间的短链分支的こ烯聚合物。  homogeneously branched linear interpolymers include ethylenically ko lack long chain branching but has a short copolymer derived from the polymerization of comonomer and evenly distributed within the same polymer chain and between different polymer chains ko branched alkylene polymer chain. 也就是说，均匀支化的线型こ烯共聚体就像使用如Elston在美国专利3，645，992中所述的均匀支化分布聚合法制成的线型低密度聚こ烯聚合物或线型高密度聚こ烯聚合物的情况那样，缺乏长链支化。 That is, homogeneously branched linear interpolymers ko alkenyl as used as the Elston in U.S. Patent No. 3,645,992 uniform branching distribution polymerization method of linear low density polyethylene polymers or linear alkenyl ko ko case of high-density polyethylene as olefin polymers, the lack of long chain branching. 均勻支化的线型こ烯/ a -烯烃共聚体的商业实例包括Mitsui ChemicalCompany 供应的TAFMER™ 聚合物和ExxonMobilChemical Company 供应的EXACTTM 聚合物。 Homogeneously branched linear alkenyl ko / a - Commercial examples of olefin interpolymer comprises a polymer Mitsui ChemicalCompany EXACTTM supplied ExxonMobilChemical Company and TAFMER ™ polymers supplied. 本发明中所用的基本线型こ烯共聚体描述在美国专利Nos. 5，272，236 ；5，278，272 ;6，054，544 ;6，335，410和6，723，810中，各自的整个内容并入本文。  The substantially linear interpolymers ko alkenyl as used in the present invention is described in U.S. Patent Nos 5,272,236;. 5,278,272; 6,054,544; 6,335,410 and 6,723,810 , the entire contents of each are incorporated herein by reference. 基木线型的こ烯共聚体是其中共聚单体无规分布在给定共聚体分子中且其中基本所有共聚体分子在该共聚体内具有相同的こ烯/共聚单体比率的那些。 Ko alkenyl group wood linear interpolymers in which the comonomer is randomly distributed within a given interpolymer molecule and wherein substantially all of the interpolymer molecules have the same copolymerizable ethylenically vivo ko / comonomer ratio of those monomers. 此外，基本线型的こ烯共聚体是具有长链支化的均匀支化こ烯聚合物。  Further, ko alkylene interpolymers are homogeneously branched substantially linear olefin polymers of the ko having long chain branching. 长链分支具有与聚合物骨架相同的共聚单体分布，并可以具有与聚合物骨架大致相同的长度。 Distribution of long chain branches have the same comonomer polymer backbone, the polymer backbone and can have about the same length. “基本线型”通常是指平均被每1000个总碳数（包括骨架和分支碳）0. 01个长链分支至每1000个总碳数3个长链分支取代的聚合物。 "Substantially linear," typically means average by per 1000 total carbons (including backbone and branch carbons) 0.01 long chain branches per 1000 total carbons to 3 long chain branches substituted polymer. ー些基本线型的聚合物可以被每1000个总碳数0. 01个长链分支至每1000个总碳数I或0. 5个长链分支，更优选每1000个总碳数0. 05个长链分支至每1000个总碳数I或0. 5个长链分支，尤其是每1000个总碳数0. 3个长链分支至每1000个总碳数I或0. 5个长链分支取代。  ー these substantially linear polymers may be per 1000 total carbon number of 0.01 long chain branches per 1000 total carbon number of I or 0.5 long chain branches, more preferably per 1000 total carbons number of 0.05 to long chain branches per 1000 total carbon number of I or 0.5 long chain branches, in particular per 1000 total carbons 0.3 long chain branches per 1000 total carbons to number 0 or I 5-substituted long chain branching. 基本线型聚合物的商业实例包括ENGAGE™聚合物（前身DuPontDow ElastomersL. L. C•,现在是The Dow Chemical Company)和AFFINITYTM 聚合物(The Dow Chemicalしompany)。 Commercial examples  substantially linear polymers include the ENGAGE ™ polymers (formerly DuPontDow ElastomersL. L. C •, now The Dow Chemical Company) and AFFINITYTM polymers (The Dow Chemical shi ompany). 基本线型的こ烯共聚体构成均匀支化的こ烯聚合物的ー种独特类型。ー ko of unique types of olefin polymer  The substantially linear interpolymers ko alkenyl homogeneously branched configuration. 它们基本不同于Elston在美国专利3，645，992中所述的传统的均匀支化线型こ烯共聚体的公知类型，此外，它们与传统的异相齐格勒-纳塔催化剂聚合的线型こ烯聚合物（例如，超低密度聚こ烯（ULDPE)、线型低密度聚こ烯（LLDPE)或高密度聚こ烯（HDPE)，例如使用Anderson等人、在美国专利4，076，698中公开的技术制成）不是相同类型；它们与高压、自由基引发的、高度支化聚こ烯（例如低密度聚こ烯（LDPE)、こ烯-丙烯酸（EAA)共聚物和こ烯こ酸こ烯酯(EVA)共聚物）也不是相同类型。 They are substantially different from Elston in U.S. Patent No. 3,645,992 the conventional homogeneously branched linear ko copolymerizable ethylenically known type, and moreover, with their traditional heterogeneous Ziegler - Natta catalyst polymerized linear type ko olefin polymer (e.g., ultra low density polyethylene ko-ene (ULDPE), linear low density polyethylene ko-ene (LLDPE) or high density polyethylene ko-ene (HDPE), for example, Anderson et al., in U.S. Patent No. 4,076 made in the disclosed technique 698) are not the same type; they are high pressure, free-radical initiated, highly branched poly-ene ko (ko-ene such as low density polyethylene (LDPE), ko-ene - acrylic acid (EAA) copolymers and ko alkenyl ko ko-ene acid acetate (EVA) copolymer) is not the same type. 通过高温三重检测器凝胶渗透色谱法（3D-GPC)表征聚合物分子量。  molecular weight of polymer characterized by high temperature triple detector gel permeation chromatography (3D-GPC). 该色谱系统由配有Precision Detectors (Amherst, MA) 2_角度激光散射检测器Model2040和来自Viscotek(Houston, TX)的4_ 毛细管差不粘度计检测器Modell50R 的Waters (Millford,MA) “150°C高温”色谱仪构成。 The chromatographic system is equipped with a Precision Detectors (Amherst, MA) 2_ Model2040 angle laser light scattering detector and differential capillary 4_ nonstick meter from the detector Viscotek (Houston, TX) is Modell50R a Waters (Millford, MA) "150 ° C high temperature "chromatograph configuration. 光散射检测器的15°角用于计算用途。 The light scattering detector angle of 15 ° for calculating purposes. 经由来自PolymerChar,巴伦西亚,西班牙的红外检测器（IR4)测量浓度。  (IR4) by measuring the concentration of an infrared detector from a PolymerChar, Valencia, Spain. 使用 Viscotek TriSEC 软件版本3 和4_ 通道Viscotek Data ManagerDM400 进行数据收集。  using Viscotek TriSEC software version 3 and 4_ channel Viscotek Data ManagerDM400 data collection. 该系统配有来自Polymer Laboratories的在线溶剂脱气设备。 The system is equipped with on-line solvent degas device from Polymer Laboratories. 圆盘传送带_室在140°C下运行，且柱室在150°C下运行。 _ Carousel chamber operating at 140 ° C, and the column compartment was operated at 150 ° C. 该柱为四个Shodex HT806M30厘米，13微米柱和ー个ShodexHT803M15厘米，12微米柱。 The column was a Shodex HT806M30 four cm, 13 micron columns and a ShodexHT803M15 ー cm, 12 micron columns. 聚合物溶液在1，2，4三氯苯（TCB)和十氢化萘(萘烷）中制备。 Polymer solution in 1,2,4-trichlorobenzene (TCB) and decahydronaphthalene (decalin) was. 在50毫升溶剂中以0.1克聚合物的浓度制备样品。 In 50 milliliters of solvent Samples were prepared at a concentration of 0.1 grams of polymer. 色谱溶剂和样品制备溶剂含有200ppm的丁基化羟基甲苯（BHT)。 The chromatographic solvent and the sample preparation solvent contained 200ppm of butylated hydroxytoluene (BHT). 这两种溶剂源均用氮气鼓泡。 Both solvent sources were nitrogen sparged. 聚こ烯样品在160°C下温和搅拌4小吋。 Poly-ene ko inch sample gently stirred for 4 hours at 160 ° C. 注射量为200微升，流速为0. 67毫升/分钟。 The injection volume was 200 microliters, the flow rate was 0.67 ml / min. 用21个窄分子量分布聚苯こ烯标样进行GPC柱设定的校准。  Calibration of the GPC column set was performed comp distribution polystyrene ko alkenyl with 21 narrow molecular weight standard. 标样的分子量为580至8，400, 000,并且设置为6种“鸡尾酒”混合物，其中各分子量之间相差至少十进位。 Standard molecular weight from 580 to 8,400, 000, and is set to 6 "cocktail" mixtures, with at least a molecular weight between decimal. 其中M是分子量，A具有0. 431的值且B等于I. O。  where M is the molecular weight, A has a value of 0.431 and B is equal to I. O. 使用五阶多项式拟合各聚こ烯-当量校准点。  A fifth order polynomial fitting each alkylene poly ko - equivalent calibration points. 板计数=5. 54* (在最高峰值下的RVバ在1/2高度下的峰宽））~2 (2)， 其中RV是以毫升计的保留体积，且峰宽按毫升计。  plate count = 5.54 * (RV at ba peak width at half height of the highest peak in the)) - 2 (2),  where RV is the retention volume in milliliters, and the peak wide by milliliters. 其中RV是以毫升计的保留体积，且峰宽按毫升计。  where RV is the retention volume in milliliters and the peak width is in milliliters press. 用于测定多检测器偏差的系统方法按照与Balke,Mourey等人（Mourey和Balke,Chromatography Polym. Cnpt12, (1992))(Balke, ThitiratsaKul, Lew, Cheung, Mourey,Chromatography Polym. Chptl3, (1992))公开的一致的方式进行,使用内部软件优化来自Dow宽聚苯こ烯1683的双检测器对数结果至来自窄标样校准曲线的窄标准柱校准結果。  A method for measuring multi-detector system in accordance with a deviation Balke, Mourey, et al (Mourey, and Balke, Chromatography Polym. Cnpt12, (1992)) (Balke, ThitiratsaKul, Lew, Cheung, Mourey, Chromatography Polym. Chptl3, for (1992)) disclosed a consistent manner, using internal software optimization narrow standard column calibration results from Dow broad polystyrene 1683 ko alkenyl dual detector log results from the narrow standards to the calibration curve. 按照与Zimm(Zimm, BH，]. Chem. Phys. ,16,1099 (1948))和Kratochvil (KratochviI, P.，Classical Light Scattering from PolymerSolutions, Elsevier, Oxford, NY(1987))公开的一致的方式获得用于偏差測定的分子量数据。 In accordance with Zimm (Zimm, BH,]. Chem. Phys., 16,1099 (1948)) and Kratochvil (KratochviI, P., Classical Light Scattering from PolymerSolutions, Elsevier, Oxford, NY (1987)) disclosed in a manner consistent the molecular weight data obtained for the deviation measurement. 用于测定分子量的总注射浓度获自样品红外区域，和来自115，000分子量的线型聚こ烯均聚物的红外监测器校准。 For determining the molecular weight of the total concentration of the injected sample obtained from the infrared region, and from 115,000 molecular weight linear polyethylene homopolymer ko infrared monitor calibration. 假设色谱浓度、足够低以消除寻址的二次维里系数效应（浓度对分子量的效应）。 Chromatographic concentrations are assumed low enough to eliminate addressing secondary virial coefficient effects (concentration effects on molecular weight). 其中公式4和5由在TCB溶液中制成的聚合物计算。  Equation 4 and 5 wherein the polymer is calculated from the prepared solution in the TCB. 其中LSi是15度LS信号，且M校准如之前所述使用Williams和Ward的方法进行，其中公式6和7由在萘烷中制成的聚合物溶液测得。  where LSi is the 15 degree LS signal, and M is as previously described calibration using the method of Williams and Ward where equations 6 and 7 are obtained from a polymer solution prepared as measured in decalin. 为了监测随时间的偏差（这可能含有洗脱分量（由色谱变化引起）和流速分量(由泵变化引起）），通常使用后期（late)洗脱窄峰被用作为“标记峰”。  In order to monitor the deviations over time (which may contain eluted component (caused by chromatographic changes) and a flow rate component (caused by pump changes)), generally used post (LATE) eluting narrow peak is used as a "marker peak" . 因此基于溶解在洗脱样品中的癸烷流动标记建立流速标记。 Thus based on the elution sample was dissolved in decane flow marker established flow rate marker. 使用这种流速标记通过癸烷峰的对准来线性校正所有样品的流速。 This flow rate marker by the alignment using the decane peaks linearity correction to the flow rate for all samples. 然后假设标记峰的任何时间变化与流速和色谱斜率中的线性位移均相关。 Then assume that any time the linear displacement of the flow rate and chromatographic slope marker peak are associated. 色谱系统的板计数（基于如上所述的二十碳烷）应该大于32，000，且对称性应该为I. 00 至I. 12。 Plate count  The chromatographic system (based on eicosane as described above) should be greater than 32,000, and symmetry should be between I. 00 to I. 12. 使用配有RCS (冷冻冷却系统）冷却配件和自动取样器的TAInstruments ModelQ1000DSC产生DSC結果。  use with an RCS (refrigerated cooling system) cooling accessory and an autosampler TAInstruments ModelQ1000DSC produce DSC results. 全程使用50毫升/分钟的氮气吹扫气体流速。 The whole purged with nitrogen gas flow of 50 ml / min. 使用压机在175°C和1500psi(10. 3MPa)最大压カ下将样品压成薄膜大约15秒，然后在大气压下空气冷却至室温。 Using a press at 175 ° C and 1500psi (10. 3MPa) The maximum compressive grades sample is pressed into a film about 15 seconds, then air-cooled to room temperature under atmospheric pressure. 然后使用纸张打孔机将大约3至10毫克材料切成6毫米直径圆盘并称重以精确至0.001毫克。 Using the paper punch Approximately 3-10 mg of material is cut into 6 mm diameter disks and weighed to the nearest 0.001 mg. 将该圆盘放在轻铝盘（大约50毫克重量）中然后压接封闭。 The disk was placed in a light aluminum pan (about 50 mg weight) and then crimped closed. 将样品使用下列温度分布热处理：（1)将样品迅速加热至180°C，并保持等温3分钟以去除之前的任何热史，(2)然后将样品以10°C /分钟冷却速率冷却至-40°C，并在_40°C下保持3分钟，(3)然后将样品以10°C /分钟加热速率加热至150°C。 The sample using the following temperature profile heat treatment: (1) rapidly heating the sample to 180 ° C, and held isothermal for 3 minutes in any thermal history prior to removal, (2) The sample is then cooled to at 10 ° C / min cooling rate of - 40 ° C, and held for 3 minutes at _40 ° C, (3) the sample is then heated to above 150 ° C 10 ° C / min heating rate. 记录冷却曲线和二次加热曲线。 Recorded cooling curve and second heating curve. 通过将由二次热曲线测得的熔化热（Hf)除以对PE而言292J/g的理论熔化热并将该量乘以100来计算结晶度百分比（例如，结晶度百分比=(Hf/292J/g) X 100)。  through the second heat curve measured by heat of fusion (Hf) of PE, divided by the theoretical heat of fusion of 292J / g and the percent crystallinity is multiplied by the amount 100 is calculated (e.g., percent crystallinity = ( Hf / 292J / g) X 100). 钟(注意I2 = I2.16)。 Bell (Note I2 = I2.16). 指数，単位分克/分钟。 Index. Unit dg / min. 高负荷熔体指数，HLMI或I21是指使用ASTM D-1238-99，条件190°C /21. 6千克负荷测得的熔体指数，単位分克/分钟（注意I21 = 121.6)。  High load melt index, HLMI of or I21 is the use of ASTM D-1238-99, condition 190 ° C / 21. 6 kilogram load melt index measured, radiolabeling bit dg / min (note I21 = 121.6) . 树脂密度（克/立方厘米）通过Archimedes置换法，ASTM D-792-00方法B测得。  The resin density (g / cc) by Archimedes displacement method, ASTM D-792-00 Method B was measured. 根据ASTM D256-97，方法A，在室温下和在-40°C下在切ロ压模板上进行悬臂梁式冲击测量。  according to ASTM D256-97, Method A, an Izod impact at room temperature and ro measured at -40 ° C cut at the die plate. 样品根据ASTM D1928-96压模。 The sample stamper ASTM D1928-96. 将树脂压模成圆盘以測量流变性。  The resin stamper into a disk to measure rheology. 通过将样品压成0.071 " (I. 8毫米）厚的板并随后将其切成I英寸圆盘来制备圆盘。压模程序如下：365 0F (185°C )在IOOpsi下5分钟；365 T在1500psi下3分钟；和以27 0F /分钟冷却至环境温度。 By pressing the samples into 0.071 "(I. 8 mm) thick plates and subsequently cut to prepare a disk stamper disk I inch procedure is as follows: 365 0F (185 ° C) at IOOpsi 5 min; 365 T at 1500psi for 3 minutes; and at 27 0F / min was cooled to ambient temperature. 在 ARES I (高级流变膨胀系数（Advanced Rheometric ExpansionSystem))流变仪S/N714806上测量树脂流变性。  In the ARES I (Advanced Rheometric expansion coefficient (Advanced Rheometric ExpansionSystem)) rheometer S / N714806 resin on rheological measurements. ARES是应变受控流变仪。 ARES is a strain controlled rheometer. 旋转式激励器（伺服电机）向样品施加应变形式的剪切形变。 A rotary actuator (servomotor) applied shear deformation in the form of strain to a sample. 在响应中，样品产生扭矩，其通过传感器測量。 In response, the sample generates torque, which is measured by the sensor. 使用应变和扭矩计算动态机械性质，例如模量和粘度。 Strain and torque calculation using the dynamic mechanical properties, such as modulus and viscosity. 在熔体中使用平行板装置，在恒定应变（5% )和温度(190。。)下，随变动的频率(0. 01至500秒-1)测量样品的粘弹性性质。 In the melt using a parallel plate apparatus, the constant strain (5 percent) and temperature (190 ..), frequency (0.01 to 500 seconds -1) measured with variation of the viscoelastic properties of the sample. 使用RheometricsOrchestrator软件(v. 6. 5. 8)测定树脂的储能模量(G，)、损耗模量(G”)、tan delta和复数粘度（O。 Measuring the storage modulus of the resin (G,) using RheometricsOrchestrator software (v. 6. 5. 8), loss modulus (G "), tan delta, and complex viscosity (O. 根据ASTM D1822-99在压模板上进行拉伸冲击测量。  tensile impact measurement stamper plate according to ASTM D1822-99. 样品根据ASTM D1928-96压摸。 The sample is pressed touch ASTM D1928-96. 根据ASTM-D1693-01，方法B测量树脂抗环境应カ开裂性（ESCR)。  According to ASTM-D1693-01, Method B should measure a resin resistant to environmental cracking ka (ESCR). 根据该试验，在恒定应变条件下并在存在开裂促进剂（例如肥皂或其它润湿剂）的情况下，测量树脂对开裂引起的机械破坏的敏感性。 According to this test case, under constant strain conditions, and in the presence of cracking promoter (e.g., a soap or other wetting agent), the sensitivity of the resin to mechanical failure due to cracking measurement. 在切ロ试样上，在保持在50°C下的10体积％ IgepalC0-630 (vendor Rhone-Poulec，NJ)水溶液中进行测量。 , The measurement is maintained at 50 ° C for 10 vol% IgepalC0-630 (vendor Rhone-Poulec, NJ) aqueous solution of the sample in the tangential ro. 每次测量均评测10个试样。 Reviews 10 each sample were measured. 报道树脂的ESCR值作为F50 (由概率图计算出的50%破坏时间)。 ESCR value of the resin is reported as F50 (calculated by the probability of 50% failure time). 弯曲和割线模量性质 通过根据ASTM D790-99方法B以0. 5英寸/分钟（13毫米/分钟）的试验速度測量弯曲模量和割线模量，表征树脂硬度。  and the secant flexural modulus properties  By measuring the flexural modulus and the secant modulus at 0.5 inches / minute (13 mm / min) according to ASTM D790-99 test speed of Procedure B, the resin hardness characterization . 根据ASTMD-4703-00附录I以在大约190°C下的5分钟初始加热期和根据程序C的15°C /分钟冷却速率，压模试样。 I is at about 190 ° C for 5 min initial heating period C according to the procedure and in the 15 ° C / min cooling rate, sample stamper according to ASTMD-4703-00 Appendix. 将试样在压机中在继续冷却下冷却至45°C直至“冷却至可接触（cool to the touch)”。 The sample was cooled under continued cooling to 45 ° C in the press until "cool to the contacts (cool to the touch)". 根据ASTM D-638-03測量屈服抗拉强度和极限抗拉强度。  tensile strength at yield and ultimate tensile strength measured according to ASTM D-638-03. 这两种測量均在23°C下在根据ASTM D4703-00附录AI以在大约190°C下的5分钟初始加热期和根据程序C的15°C/分钟冷却速率压模的硬质IV试样上进行。 Both were measured at 23 ° C for AI according to ASTM D4703-00 Appendix at about 190 ° C for 5 min initial heating period and the hard IV stamper according to the procedure C of 15 ° C / min cooling rate again carried out on samples. 将试样在压机中在继续冷却下冷却至45°C直至“冷却至可接触(cool to the touch)”。 The sample was cooled under continued cooling to 45 ° C in the press until "cool to the contacts (cool to the touch)". 在这些实验中，使用下列催化剂体系。  In these experiments the following catalyst systems. 以名称UCATTM描述的各催化剂是商标并且归Union Carbide Corporation, The Dow ChemicalCompany 的一个ナ公司所有。 Each of the catalysts described UCATTM name is a trademark and owned by Union Carbide Corporation, The Dow ChemicalCompany of a na all. UCAT™ J-镁-钛催化剂体系。  UCAT ™ J- magnesium - titanium catalyst system. 该催化剂由THF浆料喷雾干燥以形成固体粒子。 The catalyst consists THF slurry was spray dried to form solid particles. 熔融石英可以作为形态控制剂包含在该浆料中。 Fused quartz forms may comprise as the controlling agent in the slurry. 本发明的组合物在双反应器中在气相中使用UCATTMJ制备。 The composition  of the present invention is prepared using UCATTMJ in the gas phase reactor system. 所得聚合物用硬脂酸钙（600ppm)、IRGAN0X™1010 (IOOOppm)和IRGAF0S™168 (IOOOppm)稳定化，然后通过熔体挤出法制丸。 The resulting polymer with calcium stearate (600ppm), IRGAN0X ™ 1010 (IOOOppm) and IRGAF0S ™ 168 (IOOOppm) stabilized, then pellets by melt extrusion method. 抗氧化剂IRGAN0X™1010 和IRGAF0S™168 可获自Ciba-GeigyCorporation。 Antioxidants IRGAN0X ™ 1010 and IRGAF0S ™ 168 available from Ciba-GeigyCorporation. 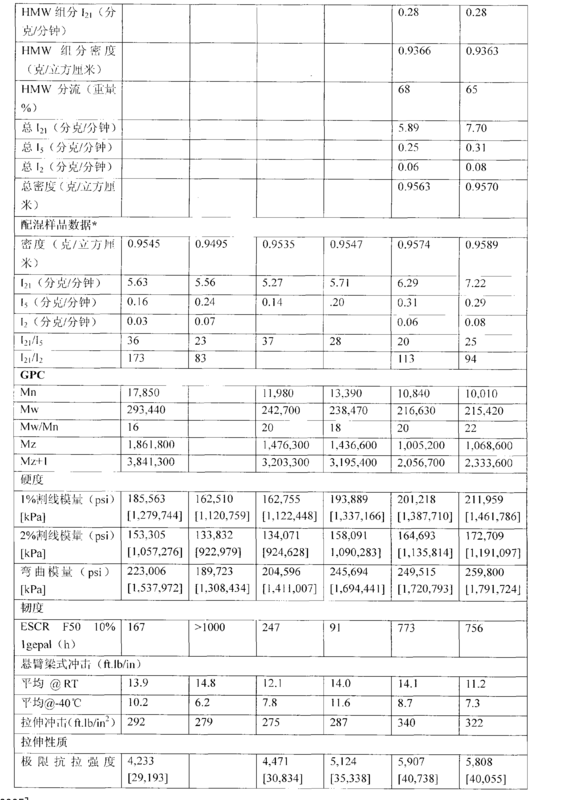 平均反应器条件显示在表I中。  The average reactor conditions are shown in Table I below. 在HMW反应器的情况下，C2分压、H2/C2比率和C6/C2比率的轻微变化归因于催化剂、反应器/迸料杂质和循环气体分析中的轻微变化。 In the case of the HMW reactor, C2 partial pressure, a slight change in H2 / C2 ratio and C6 / C2 ratios due to the catalyst, a slight change in the reactor / feed impurities, and cycle gas Beng analysis. 在LMW组分的聚合中，对产物设定温度和H2/C2比率。 In the polymerization of the LMW component of the product set temperature and the H2 / C2 ratio. 在这种情况下，不向LMW反应器中加入新鮮己烯。 In this case, no fresh hexene was added to the LMW reactor. 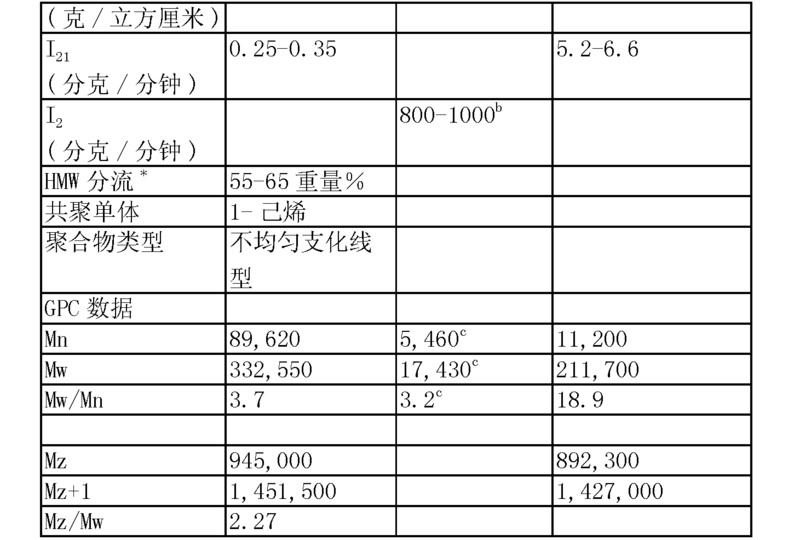 树脂性质显示在表2中。 Resin properties are shown in Table 2. \MW反应器中的唯一潜在己烯衍生自从HMW反应器转移到LMW反应器中时溶解在树脂中的己烯。  \ MW reactor only potential hexene derived from a reactor when HMW LMW reactor is transferred to the resin dissolved in the hexene. 但是，对于此实例，循环气体分析器不測量LMW反应器中的任何己烯。 However, for this example, a cycle gas analyzer does not measure any hexene in the LMW reactor. HMW分流* = (HMW反应器生产速率）/(HMW反应器生产速率+LMW反应器生产速率）。  HMW split * = (HMW reactor production rate) / (HMW reactor production rate + LMW reactor production rate). a'b' cLMW密度，熔体指数（I2)和GPC数据在LMW组分上测量，该组分在与反应器共混物相同或基本相同的反应条件下単独制备。  a'b 'cLMW density, melt index (I2) and GPC data measured on a LMW component prepare this component alone radiolabeling at a reactor blend with the same or substantially the same reaction conditions. 这些性质也可以由本领域技术人员使用基于反应条件的适当计算測定。 These properties suitable computing assay reaction conditions may be used by those skilled in the art based. 另外两个本发明的组合物和四个对比树脂的机械和流变性质显示在表3中。  The compositions of the present invention and two additional mechanical and rheological properties of the four comparative resins are shown in Table 3. 对比例 I 是单峰Dow UNIVAL™ DMDC6150NT7 树脂。  Comparative I is a unimodal Dow UNIVAL ™ DMDC6150NT7 resin. 对比例 2 是双峰Dow CONTINUUM™ DGDA2490 树脂。  Comparative Example 2 is a bimodal Dow CONTINUUM ™ DGDA2490 resin. 对比例 3 是EMCC PAXON™ HYA021L 树脂。  Comparative Example 3 is an EMCC PAXON ™ HYA021L resin. [0221 ]对比例4 是Nova NOVAPOL® HB W555A 树脂。  Comparative Example 4 is a Nova NOVAPOL® HB W555A resin. 使用UCATtm-J催化剂和双气相法技术制造多峰高密度聚こ烯树脂。  The catalyst used UCATtm-J and technology to produce double fumed multimodal high-density polyethylene resin ko-ene. 该树脂具有硬度、抗应カ开裂性和悬臂梁式抗冲击性的优异平衡。 The resin has a hardness, resistance to cracking and ka should Izod impact resistance balance is excellent. 该树脂尤其适合通过挤出吹塑法制造大尺寸容器，例如55加仑桶。 This resin is particularly suitable for manufacturing a large-sized containers by extrusion blow molding, for example, a 55 gallon drum. 性质的优异平衡使得由木发明的树脂制成的塑料容器能够替代传统金属容器。 An excellent balance of properties so that the plastic containers made of wood resin invention can replace traditional metal containers. 性质的优异平衡也能够在不损失性能的情况下降低容器壁厚。 An excellent balance of properties in vessel wall thickness can be reduced without loss of performance. 1. 一种组合物，包含高分子量组分和低分子量组分，且其中高分子量组分包含密度为0. 920克/立方厘米至0. 950克/立方厘米且I21为0. 05至I分克/分钟的こ烯共聚体，且其中低分子量组分包含密度为0. 965克/立方厘米至0. 985克/立方厘米且I2为600至2000分克/分钟的こ烯聚合物，且其中该组合物具有0. 950克/立方厘米至0. 970克/立方厘米的密度，并包含45至80重量％的高分子量组分，包含55至20重量％的低分子量组分，其中重量百分比基于高分子量组分和低分子量组分的总重量， 其中I21使用ASTM D-1238-99，条件190 V /21. 6千克负荷测得，I2使用ASTMD-1238-99，条件190°C /2. 16千克负荷测量， 且其中闻分子量こ烯共聚体具有I. 5至10的分子量分布Mw/Mn。 1. A composition comprising a high molecular weight component and the low molecular weight component, and wherein the high molecular weight component having a density of 0.920 g / cc to 0.950 g / cc to 0.05 and I21 is I dg / min ko alkylene interpolymer, and wherein the low molecular weight component having a density of 0.965 g / cc to 0.985 g / cc and I2 of from 600 to 2000 g / min ko olefin polymer, and wherein the composition has a 0.950 g / cc to a density of 0.970 g / cc, and contains 45 to 80% by weight of the high molecular weight component, comprises 55 to 20% by weight of the low molecular weight component, wherein weight percent based on the total weight of the high molecular weight component and the low molecular weight component, wherein use I21 ASTM D-1238-99, condition 190 V / 21. 6 kilogram load measured, I2 using ASTMD-1238-99, condition 190 ° C / 2.16 kg load is measured, and wherein the smell molecular weight interpolymer having a molecular weight alkenyl ko I. 5 to 10 distribution Mw / Mn. 2.根据权利要求I所述的组合物，其中该组合物具有3至15分克/分钟的I21，其中I21使用ASTM D-1238-99，条件190°C /21. 6千克负荷测得。 2. The composition according to claim I, wherein the composition has 3 to 15 dg / min I21, where I21 using ASTM D-1238-99, condition 190 ° C / 21. 6 kilogram load measured. 3.根据权利要求I所述的组合物，其中该组合物包含50至75重量％的高分子量组分和25至50重量％的低分子量组分。 3. The composition of claim I, wherein the composition comprises 50 to 75% by weight of the high molecular weight component and from 25 to 50 wt% of low molecular weight component. 4.根据权利要求I所述的组合物，其中高分子量こ烯共聚体具有0. 925克/立方厘米至0. 950克/立方厘米的密度。 4. The composition according to claim I, wherein the high molecular weight copolymer having ethylenically ko 0.925 g / cc to 0.950 g cm3, /. 5.根据权利要求I所述的组合物，其中该组合物具有0. 955克/立方厘米至0. 970克/立方厘米的密度。 5. The composition according to claim I, wherein the composition has a 0.955 g / cc to a density of 0.970 g / cc. 7.根据权利要求I所述的组合物，其中低分子量こ烯聚合物是均聚物。 7. The composition according to claim I, wherein the low molecular weight olefin polymer is a homopolymer ko. 8.根据权利要求I所述的组合物，其中高分子量こ烯共聚体是こ烯/ a -烯烃共聚体。 8. The composition according to claim I, wherein the high molecular weight copolymer is ko ko alkenyl ene / a - olefin interpolymer. 9.根据权利要求8所述的组合物，其中a -烯烃是C3-C2tl烯烃。 9. The composition of claim 8, wherein the a - olefin is a C3-C2tl olefins. 10.根据权利要求I所述的组合物，其中高分子量こ烯共聚体以大于或等于55重量％的量存在。 10. The composition according to claim I, wherein the high molecular weight copolymer of ethylenically ko amount greater than or equal to 55% by weight. 11.根据权利要求I所述的组合物，其中低分子量こ烯聚合物以小于或等于45重量％的量存在。 11. The composition of claim I wherein the low molecular weight olefin polymer ko less than or equal to 45% by weight. 12.根据权利要求I所述的组合物，其中低分子こ烯聚合物具有700至1，150分克/分钟的I2值。 12. The composition according to claim I, wherein the low molecular weight olefin polymer having ko 700 to 1,150 dg / min I2 value. 13.根据权利要求I所述的组合物，其中低分子量こ烯聚合物是こ烯/ a -烯烃共聚体。 13. The composition of claim I, wherein the olefin polymer is a low molecular weight ko ko-ene / a - olefin interpolymer. 14.根据权利要求13所述的组合物，其中各a-烯烃是C3-C2tl烯烃。 14. The composition according to claim 13, wherein each olefin is a C3-C2tl a- olefins. 15.根据权利要求I所述的组合物，其中高分子量组分以大于或等于高分子量组分和低分子量组分总重量的55重量％的量存在，且其中低分子量组分以小于或等于高分子量组分和低分子量组分总重量的45重量％的量存在。 15. The composition of claim I, wherein the high molecular weight component is equal to or greater than the amount of high molecular weight component and the total weight of the 55 wt% of low molecular weight components present, and wherein the low molecular weight component is less than or equal to present in an amount by weight percent of the total weight of the high molecular weight component and the low molecular weight component 45. 16.根据权利要求I所述的组合物，其中高分子量组分具有小于I分克/分钟的121，且该组合物具有大于15的分子量分布。 16. The composition according to claim I, wherein the high molecular weight component having less than I dg / min to 121, and the composition has a molecular weight distribution of greater than 15. 17.根据权利要求I所述的组合物，其中低分子量组分具有大于600分克/分钟的12，且该组合物具有大于15的分子量分布。 17. The composition of claim I, wherein the low molecular weight component having a greater than 600 g / 12 min, and the composition has a molecular weight distribution of greater than 15. 18.根据权利要求I所述的组合物，其中该组合物具有大于或等于15的分子量分布。 18. The composition according to claim I, wherein the composition has a molecular weight distribution of greater than or equal to 15. 19.根据权利要求I所述的组合物，其中高分子量组分具有小于I分克/分钟的121，且该组合物具有小于10分克/分钟的I21，其中I21使用ASTM D-1238-99，条件190°C /21. 6千克负荷测得。 19. The composition according to claim I, wherein the high molecular weight component having less than I dg / min to 121, and the composition has a I21 less than 10 dg / min, wherein I21 using ASTM D-1238-99 , condition 190 ° C / 21. 6 kilogram load measured. 20.根据权利要求I所述的组合物，其中低分子量组分具有大于600分克/分钟的12，且该组合物具有小于10分克/分钟的I21，其中I21使用ASTM D-1238-99，条件190°C /21. 6千克负荷测得，I2使用ASTMD-1238-99，条件190°C /2. 16千克负荷测量。 20. The composition according to claim I, wherein the low molecular weight component having a greater than 600 g / 12 min, and the composition has an I21 less than 10 dg / min, wherein I21 using ASTM D-1238-99 , condition 190 ° C / 21. 6 kilogram load measured, I2 using ASTMD-1238-99, condition 190 ° C / 2. 16 kilogram load measurement. 21.根据权利要求I所述的组合物，其中高分子量组分具有大于或等于3的分子量分布。 21. The composition according to claim I, wherein the high molecular weight component having a molecular weight distribution of greater than or equal to 3. 22.根据权利要求I所述的组合物，其中该组合物具有大于或等于15的分子量分布，且其中闻分子量组分具有小于或等于6的分子量分布。 22. The composition according to claim I, wherein the composition has a molecular weight distribution of greater than or equal to 15, and wherein the smell molecular weight component having a molecular weight distribution of less than or equal to 6. 23.根据权利要求I所述的组合物，其中该组合物具有大于或等于15的分子量分布，且其中低分子量组分具有小于或等于6的分子量分布。 23. The composition according to claim I, wherein the composition has a molecular weight distribution of greater than or equal to 15, and wherein the low molecular weight component having a molecular weight distribution of less than or equal to 6. 24.根据权利要求I所述的组合物，其中该组合物具有大于或等于15的分子量分布；高分子量组分具有小于或等于6的分子量分布；且低分子量组分具有小于或等于6的分子量分布。 24. The composition according to claim I, wherein the composition has a molecular weight distribution of greater than or equal to 15; molecular weight component having a molecular weight distribution of less than or equal to 6; and a low molecular weight component having a molecular weight less than or equal to 6, distributed. 25.根据权利要求I所述的组合物，其中高分子量组分和/或低分子量组分在喷雾干燥的镁-钛催化剂体系存在下形成。 25. The composition of claim I, wherein the high molecular weight component and / or low molecular weight component in the spray-drying of magnesium - titanium is formed in the presence of a catalyst system. 26.包含至少ー个由权利要求I所述的组合物形成的部件的制品。 26. An article comprising a member ー claims I to form at least the composition of the. 27.包含至少ー个由权利要求I所述的组合物形成的部件的吹塑制品。 27. A blow molded article comprising a member ー claims I to form at least the composition of the. 28.根据权利要求26所述的制品，其中该制品具有大于190，OOOpsi的1%割线模量。 28. The article according to claim 26, wherein the article has greater than 190, OOOpsi 1% secant modulus. 29.根据权利要求26所述的制品，其中该制品具有大于500小时的ESCRF50。 29. The article according to claim 26, wherein the article has ESCRF50 greater than 500 hours. 30.根据权利要求26所述的制品，其中该制品具有大于5000psi的极限抗拉强度。 30. The article of claim 26, wherein the article has an ultimate tensile strength greater than 5000psi to. 31. ー种形成制品的方法，包括吹塑权利要求I所述的组合物。 31. The method of forming an article ー species, said composition comprising I as claimed in claim blow. 32. —种制造权利要求I所述的组合物的方法，所述方法包括在双反应器中使该组合物聚合，且其中高分子量こ烯共聚体在双反应器的第一反应器中形成，且低分子量こ烯聚合物在双反应器的第二反应器中形成。 32. - The composition of the kinds I defined in claim 1, said method comprising in a dual reactor, polymerization of the composition, and wherein the high molecular weight interpolymer ko alkenyl formed in the first reactor of the dual reactors , and a low molecular weight olefin polymer ko is formed in the second reactor of the dual reactors. 33.根据权利要求32所述的方法，其中高分子量组分和/或低分子量组分在喷雾干燥的镁-钛催化剂体系存在下形成。 33. The method according to claim 32, wherein the high molecular weight component and / or low molecular weight component in the spray-drying of magnesium - titanium is formed in the presence of a catalyst system. 34.根据权利要求33所述的方法，其中高分子量组分和/或低分子量组分由气相聚合形成。 34. The method according to claim 33, wherein the high molecular weight component and / or low molecular weight component is formed from a gas phase polymerization. MX351134B (en) * 2010-04-14 2017-10-03 Dow Global Tech Llc Star Fuel containers made from polyethylene compositions with improved creep resistance.